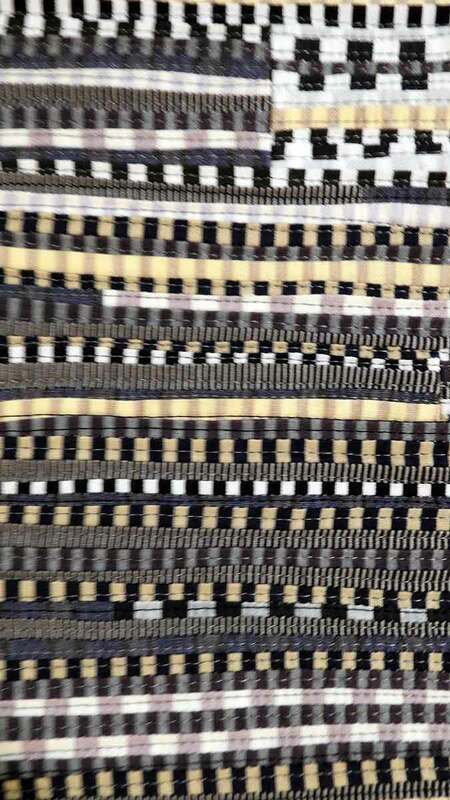 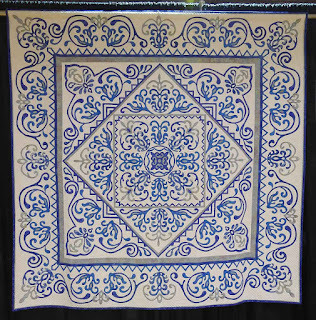 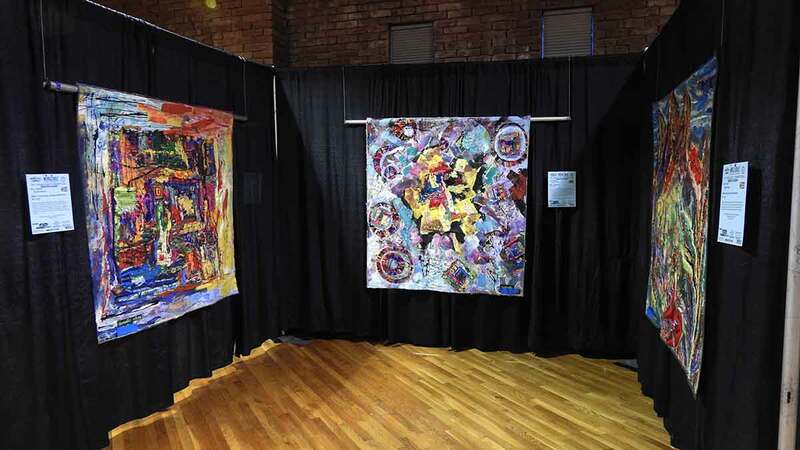 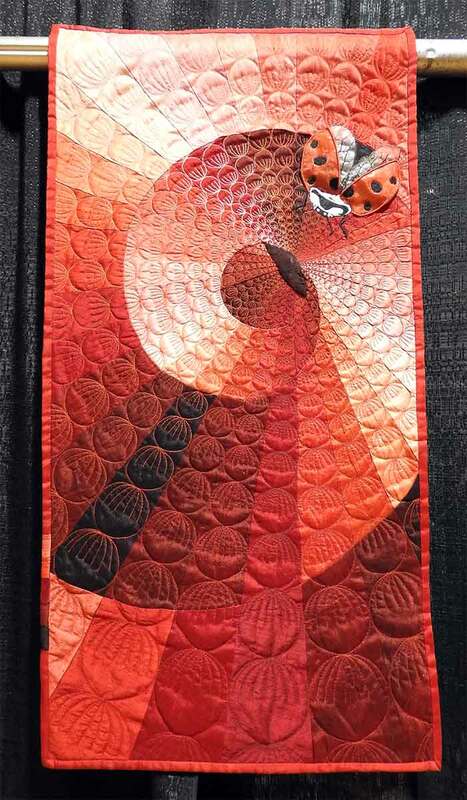 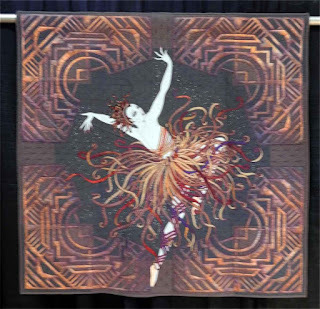 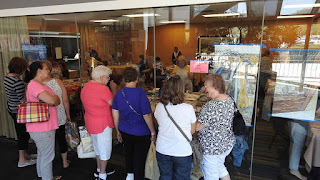 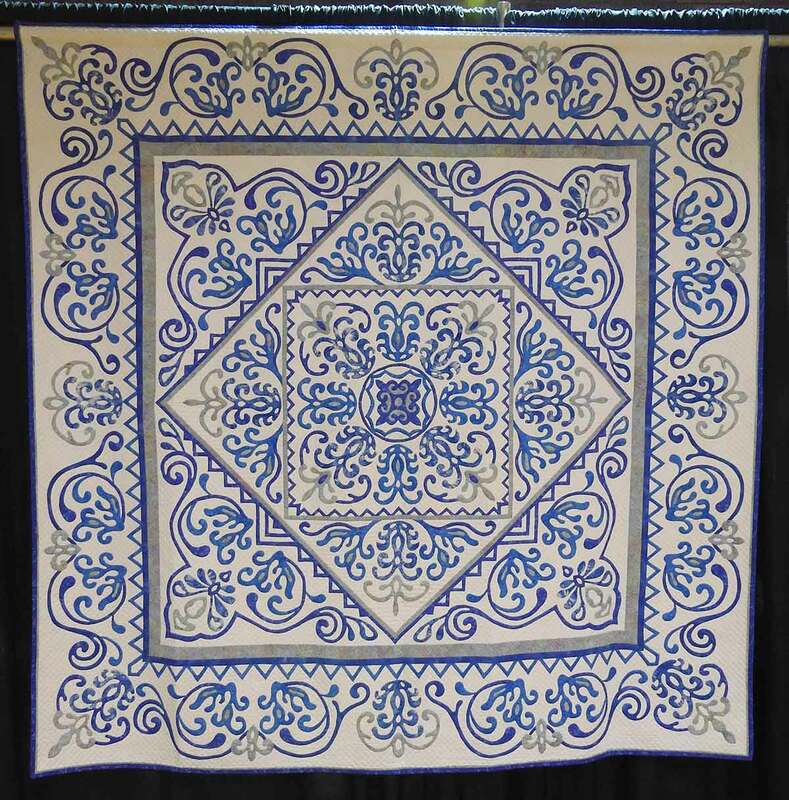 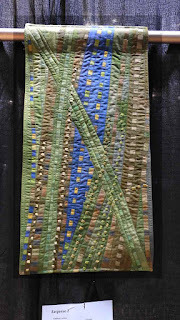 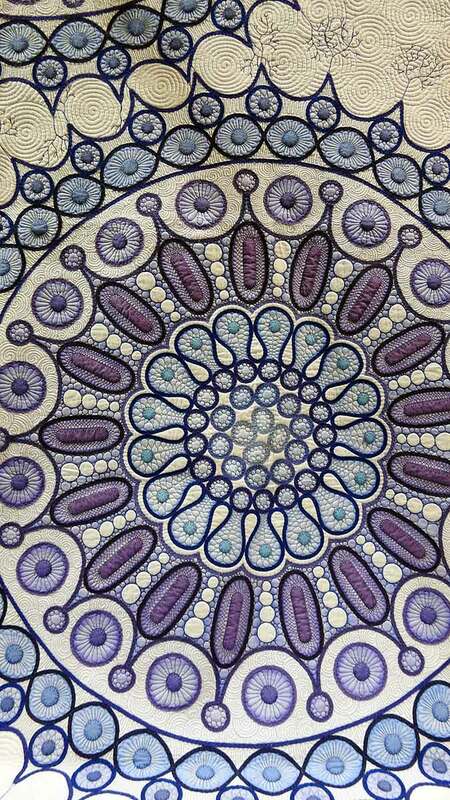 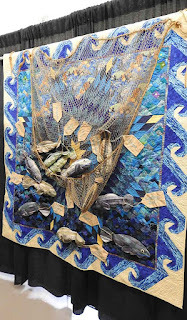 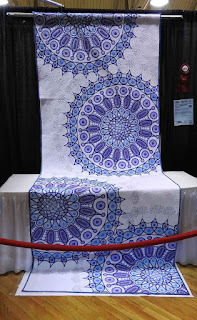 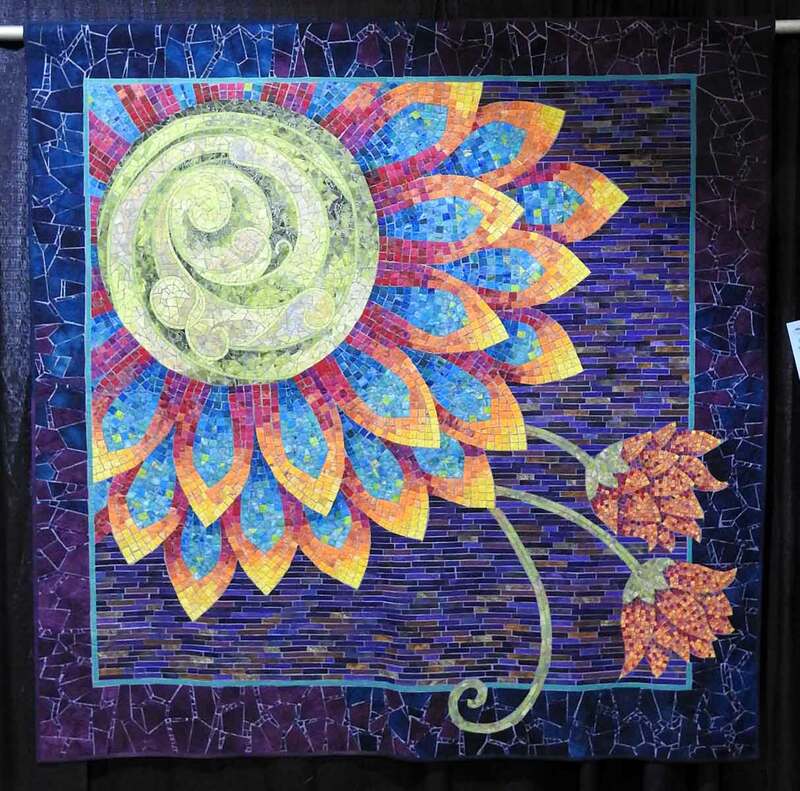 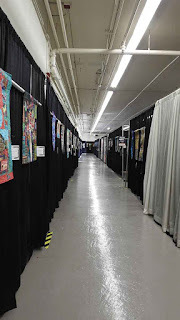 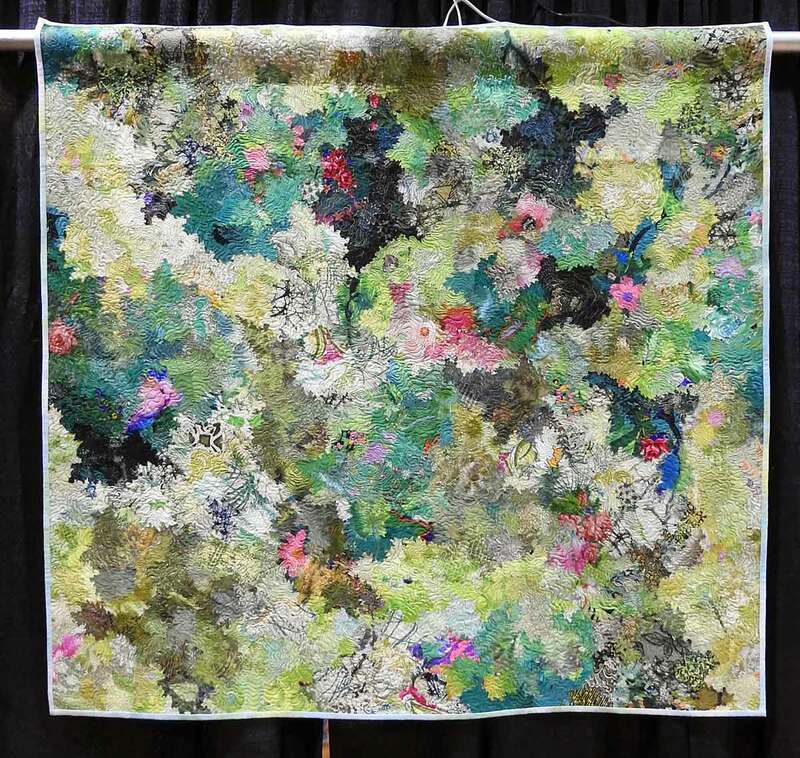 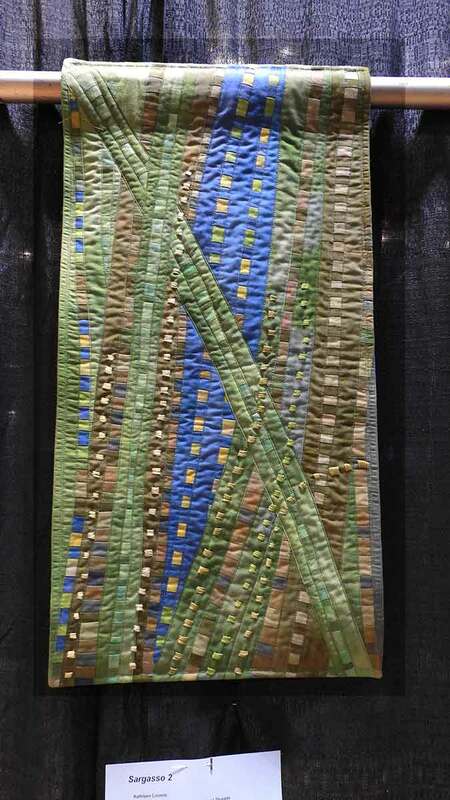 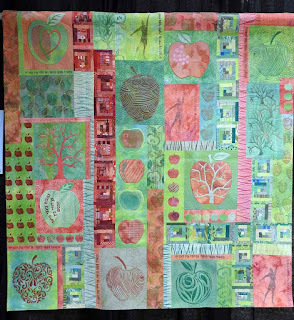 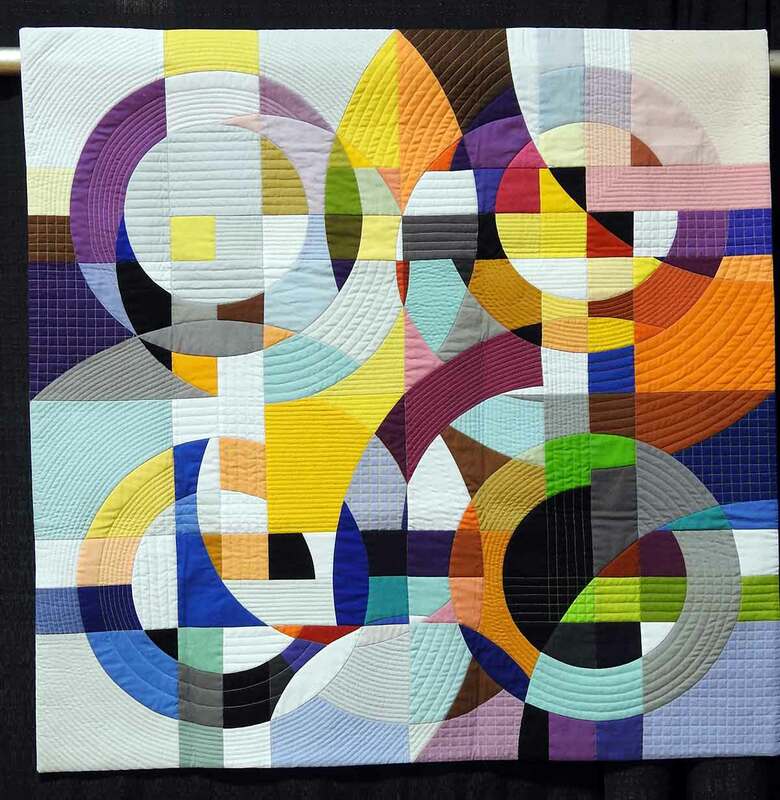 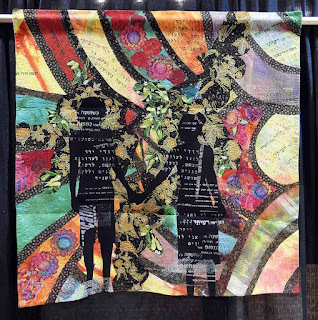 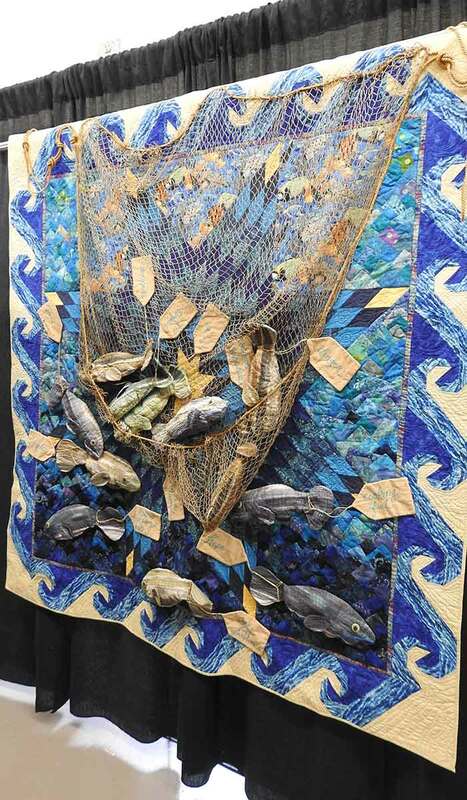 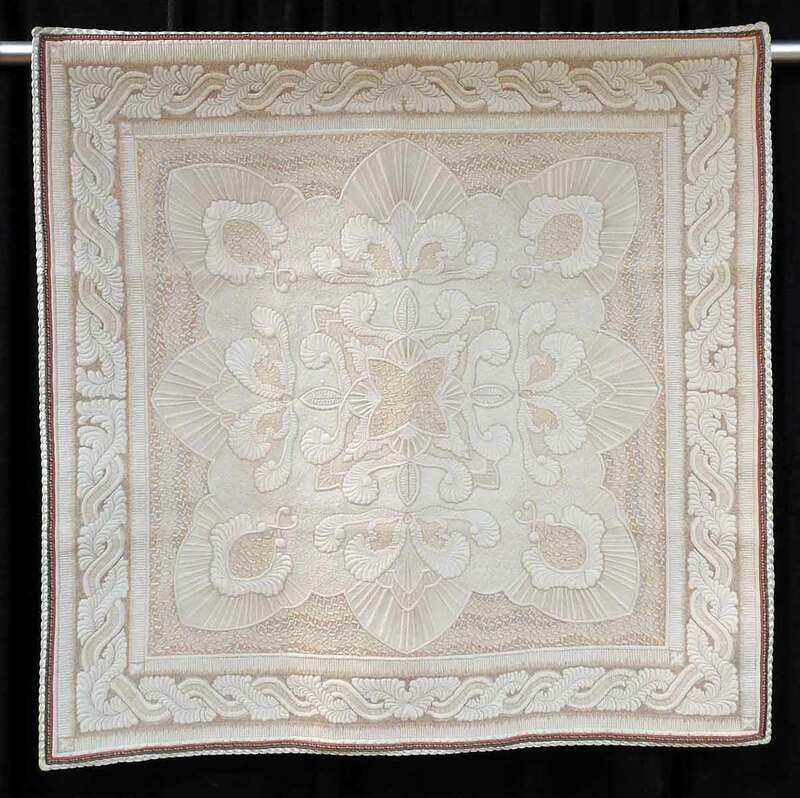 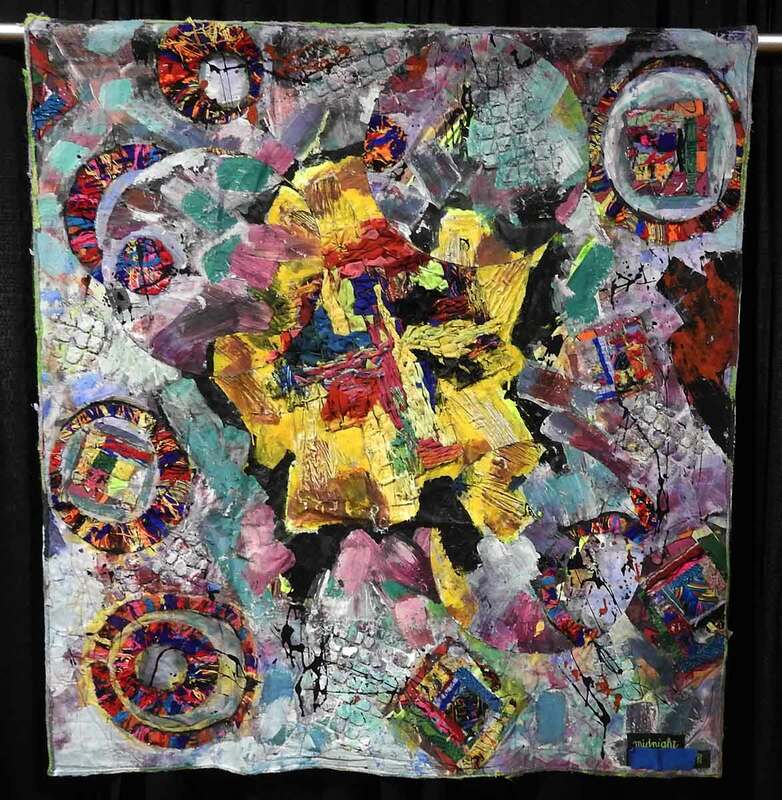 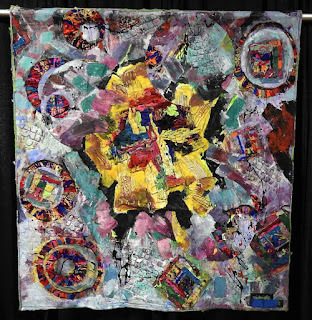 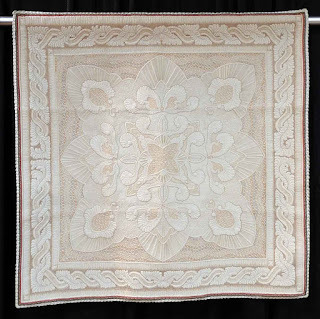 This post is a continuation of the Mancuso 15th Annual World Quilt New England quilt show. 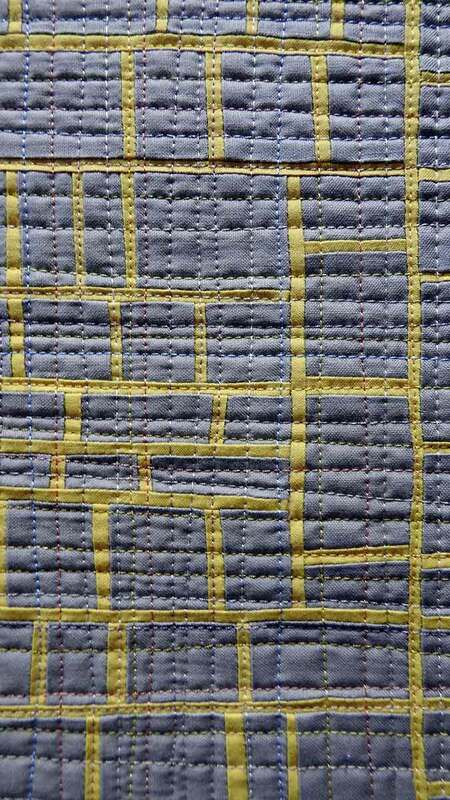 Annelize Littlefair, United Kingdom, "Nostalgia"
"This quilting design was developed from a doodle whilst waiting in an airport lounge. 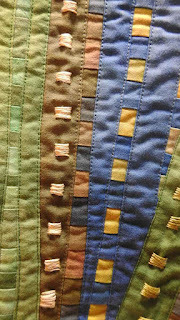 I used silk for the front and back and added piping, piped beading and satin ribbon to the edge. 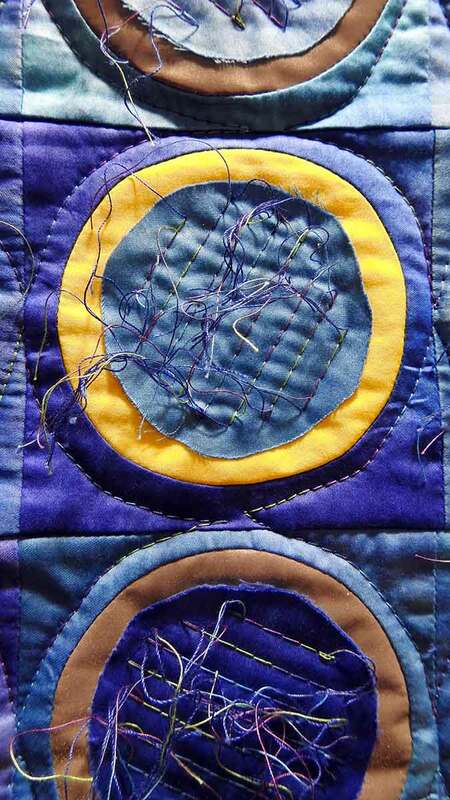 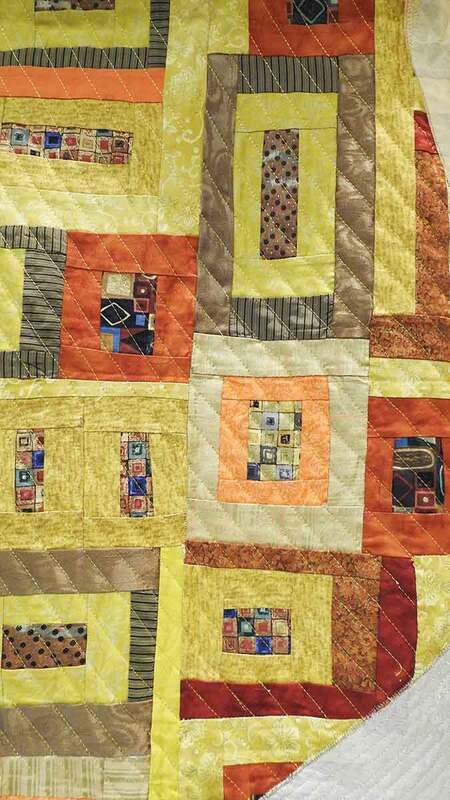 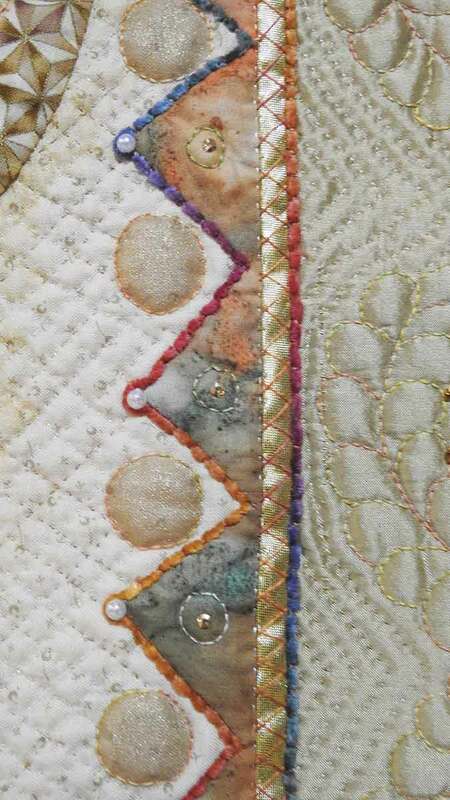 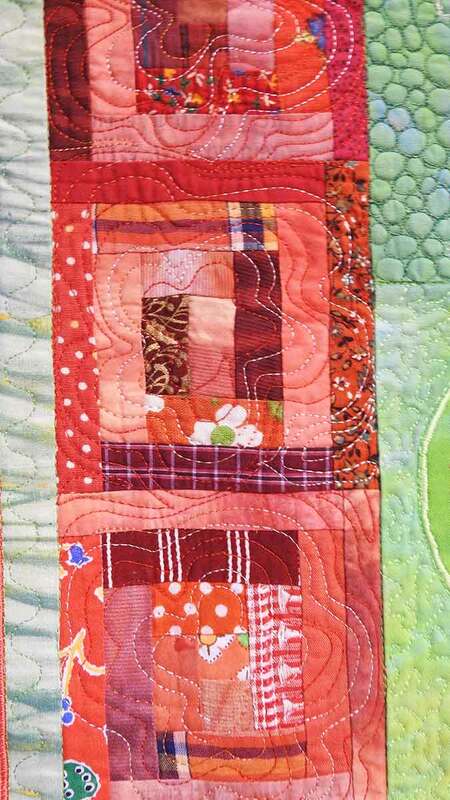 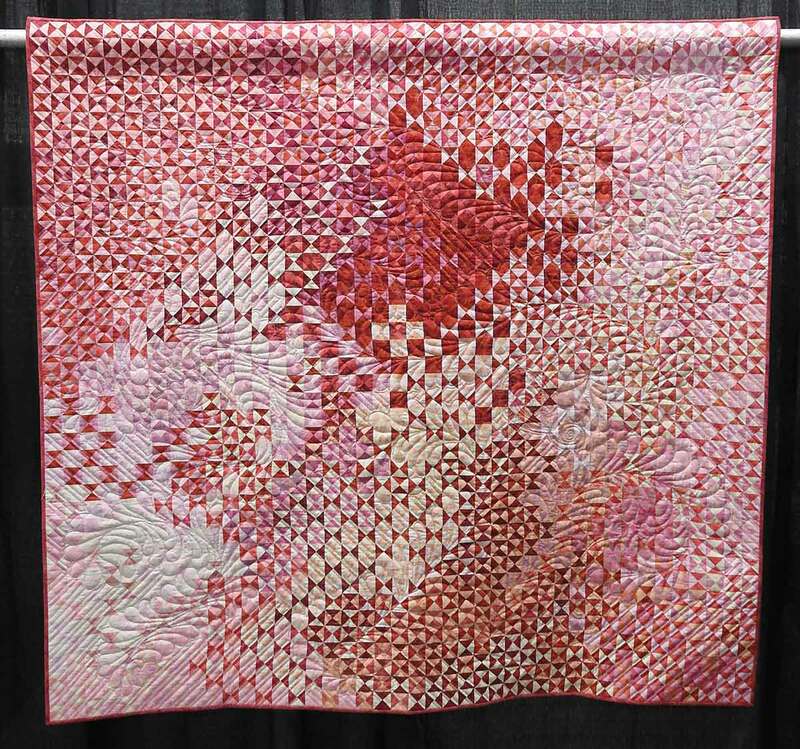 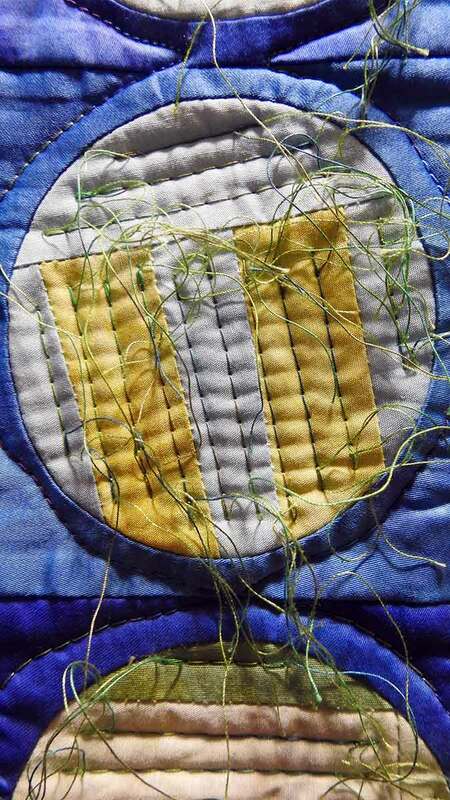 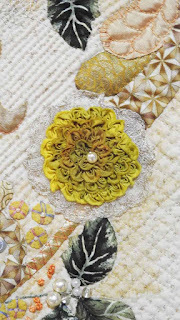 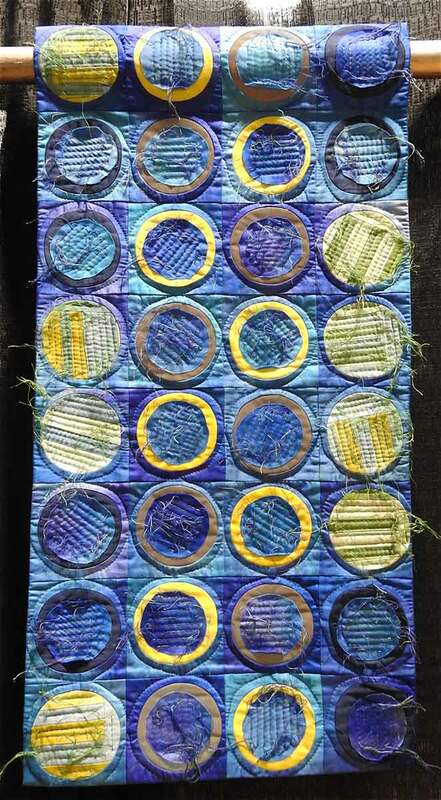 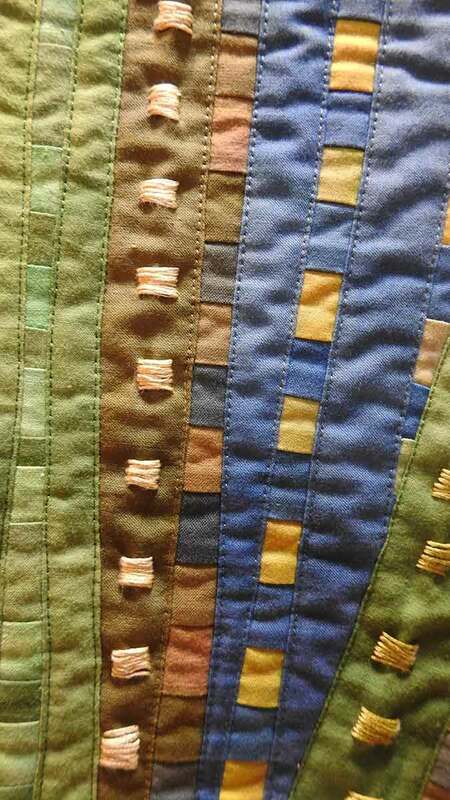 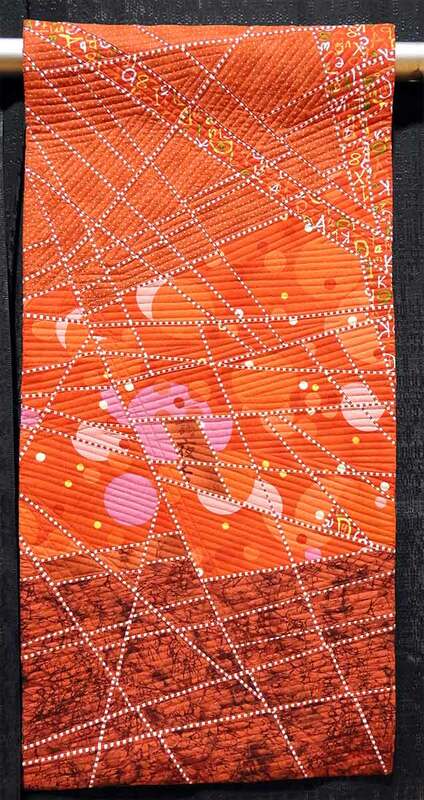 I used Quilters Dream Blend batting, kimono silk and wonderful Invisafil threads." 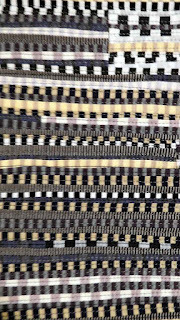 Maria Ferri Cousins & S.B. 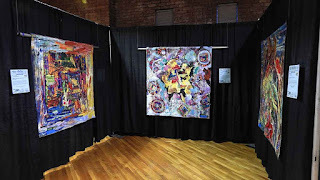 Walsh, Great River, NY, "Eye Remember"
Tamar Drucker, Israel, "Is it Digital?" 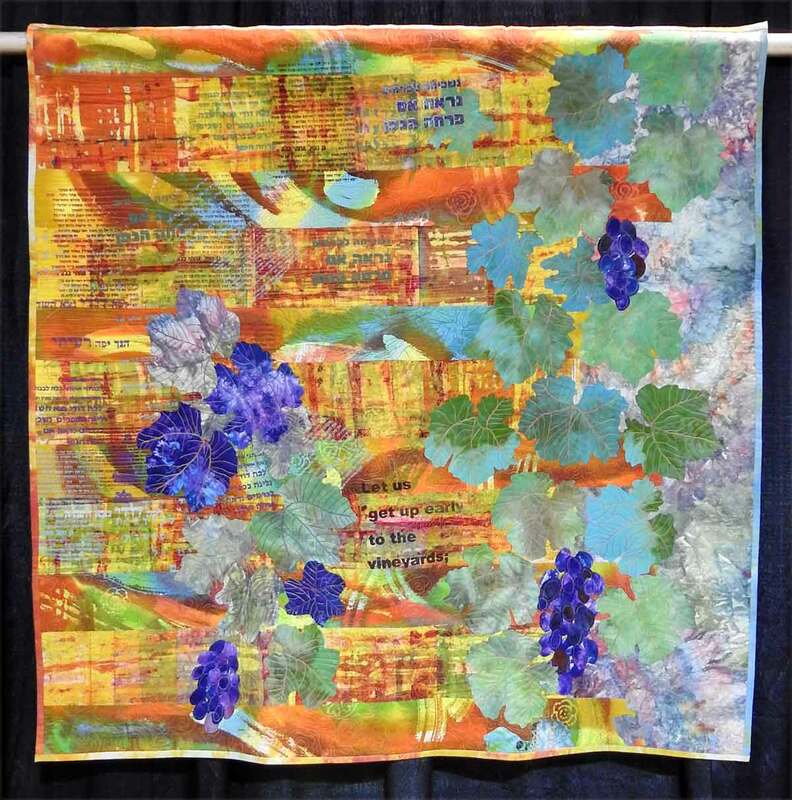 Maya Chaimovich, Israel, "The Tender Grape"
"When spring arrives, the vines grow clusters of small white flowers with heady fragrance. 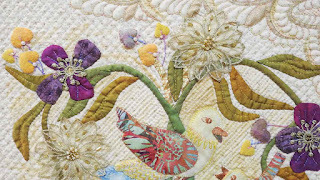 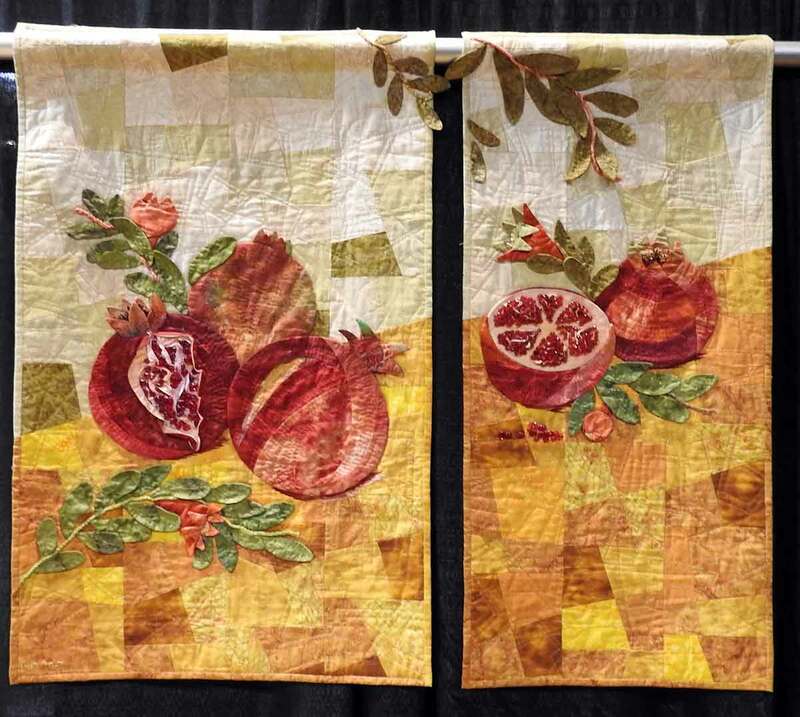 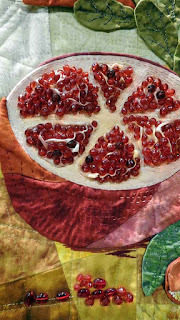 The name of this special smell in Hebrew, is my daughter's name, Smadar"
Detail of "The Tender Grape"
Eti David, Israel, "As a Lily Among Thorns"
This quilt below is precious. 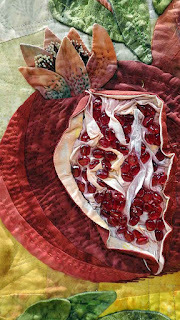 I love the title, "In the Garden of Nuts". 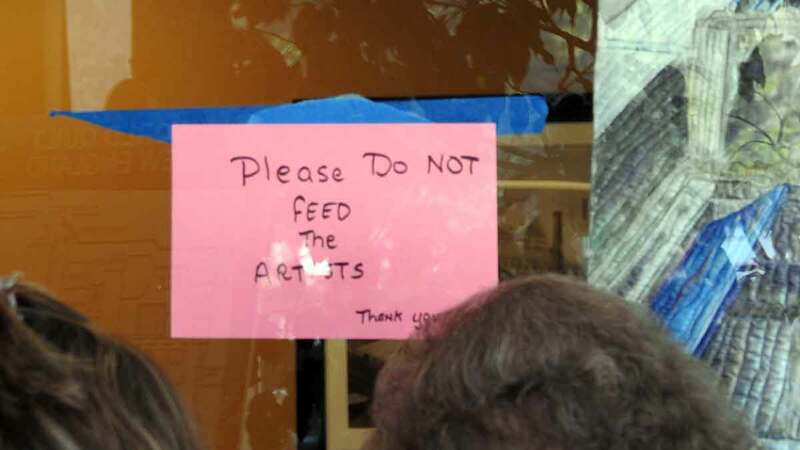 She should have put a picture of me on it instead. Tamar Rimon Hemeli, Israel, "In the Garden of Nuts"
Detail of "In the Garden of Nuts"
Niza Hoffman, Israel, "The Wilderness Shall Be Glad"
Detail of "The Wilderness Shall Be Glad"
Bella Kaplan, Israel, "I am My Beloved's and My Beloved is Mine"
"My inspiration is from Chapter 6/3. Hand dyed cotton fabric, screen printed, appliqued, machine quilted." 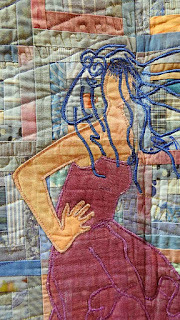 Bella Kaplan, Israel, "Let us Get Up Early to the Vineyards"
"My inspiration is from chapter 7/13. 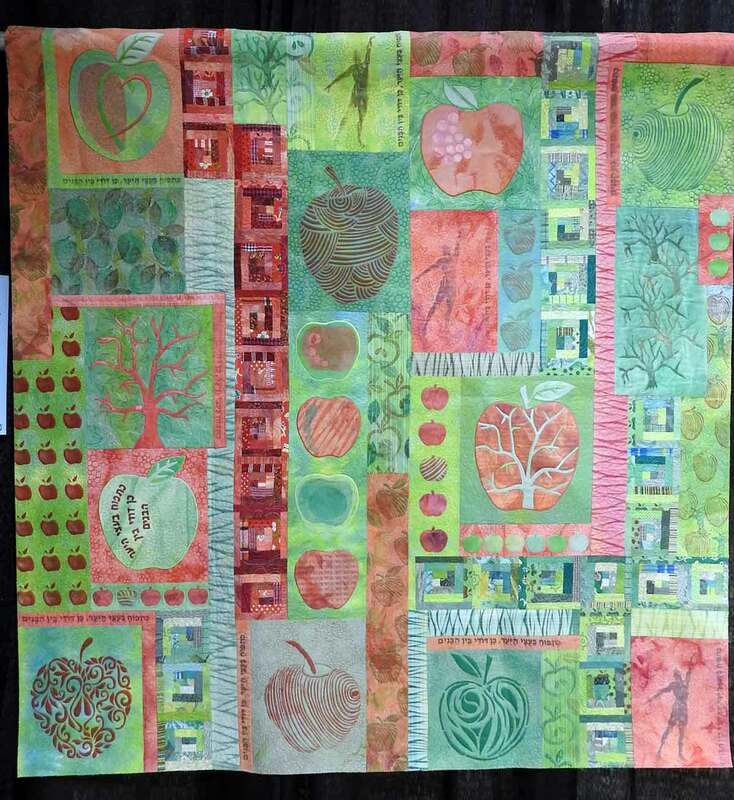 Hand dyed cotton fabric, screen printed, appliqued, machine quilted." 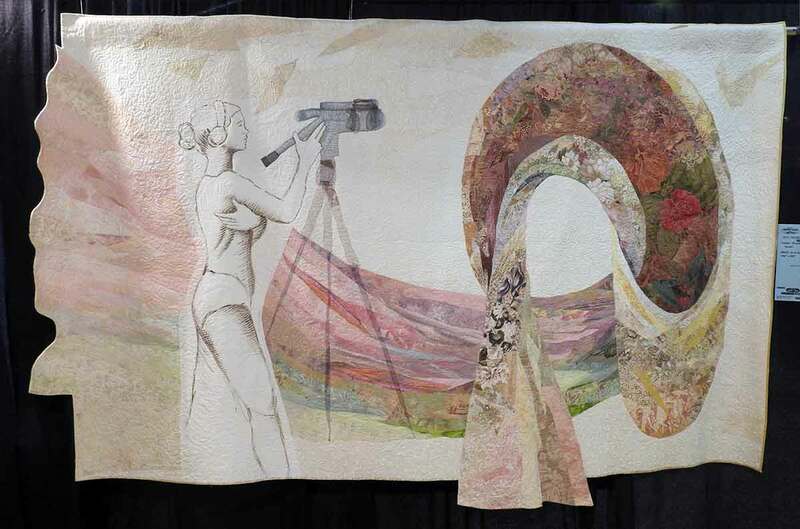 Klara Schafler-Landesberg, Israel, "Woman of Valor"
"From Proverbs 31, the text is originally a 22 verse Hebrew acrostic, each verse beginning with a different Hebrew letter. 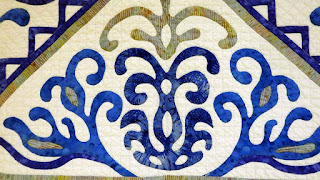 This abridged version is punctuated with 'jewels' of Hebrew letter forms. 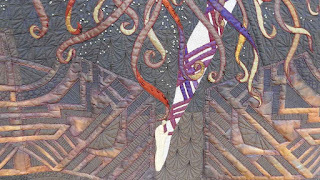 The center heading is 'Eishet Chayil,' a Woman of Valor." Detail of "Woman of Valor"
Gisha Wogier, Israel, "As an Apple Tree Among the Trees of the Wood, So is My Beloved Among the Sons"
Detail of "As an Apple Tree Among the Trees of the Wood, So is My Beloved Among the Sons"
Gisha Wogier, Israel, "You are Beautiful, My Love"
Detail of "You are Beautiful, My Love"
Jacquie Harvey, United Kingdom, "50 Hearts for 50 Years"
"I have adapted 4 blocks from Margarete Heinisch's book Mi Amore for this wall hanging to commemorate our golden wedding anniversary, October 1, 2016. 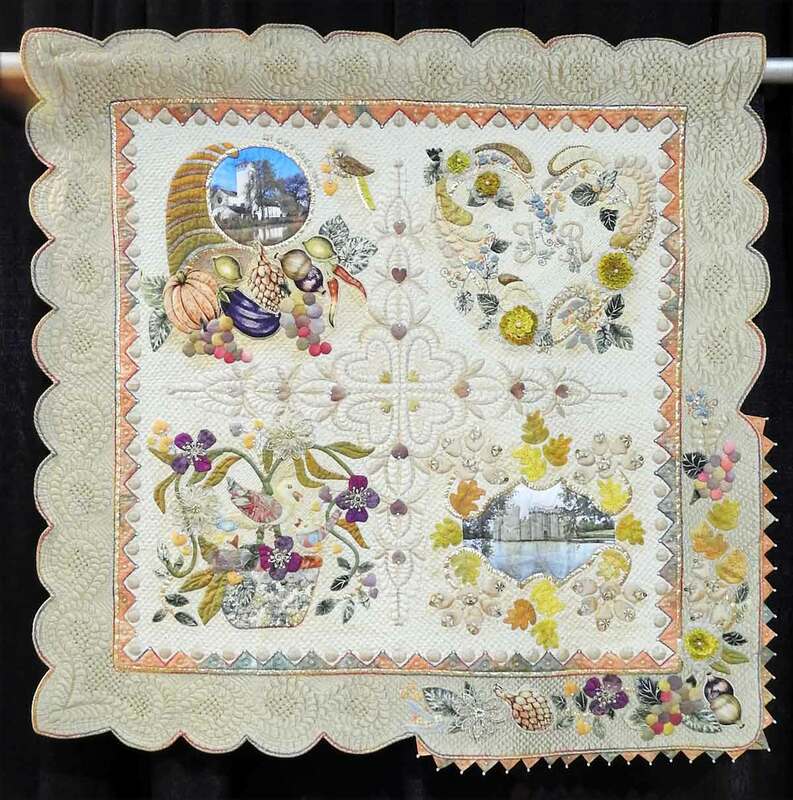 It is hand quilted throughout and appliqued using printed photos of the church (block1) we were married in at harvest time and a castle (block 4) in the village where we spent our honeymoon. 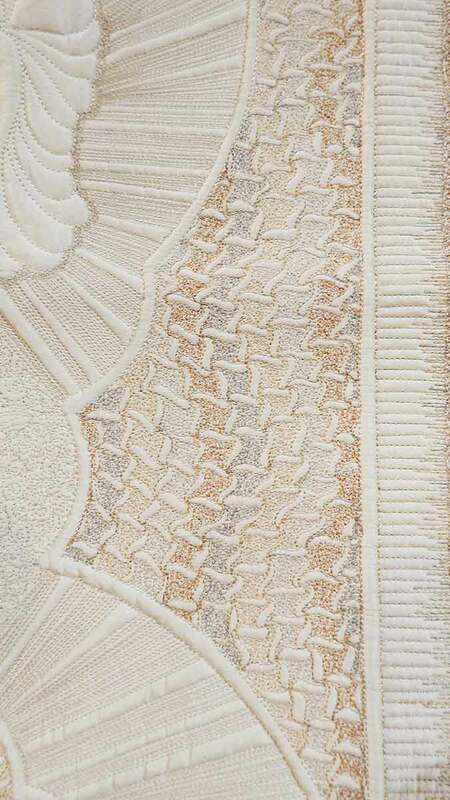 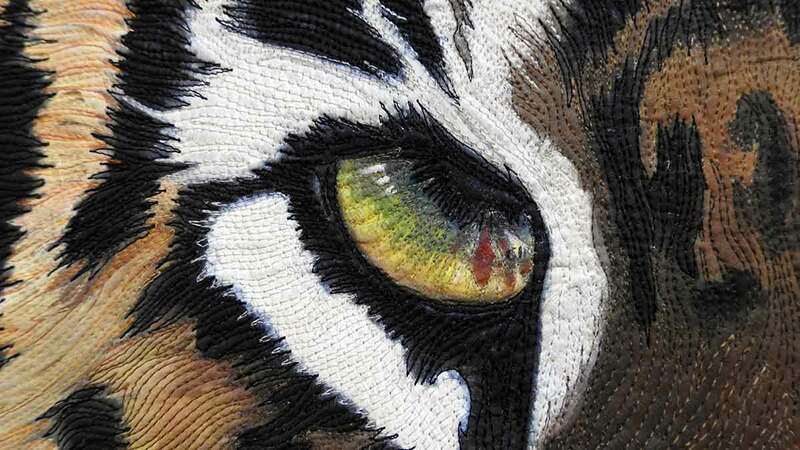 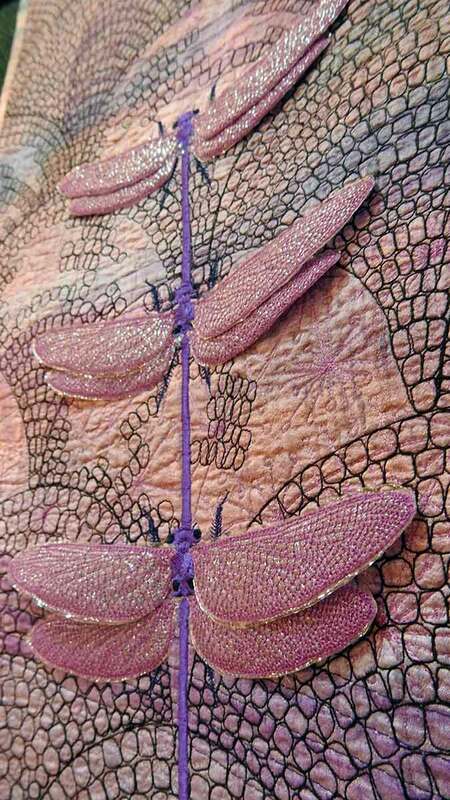 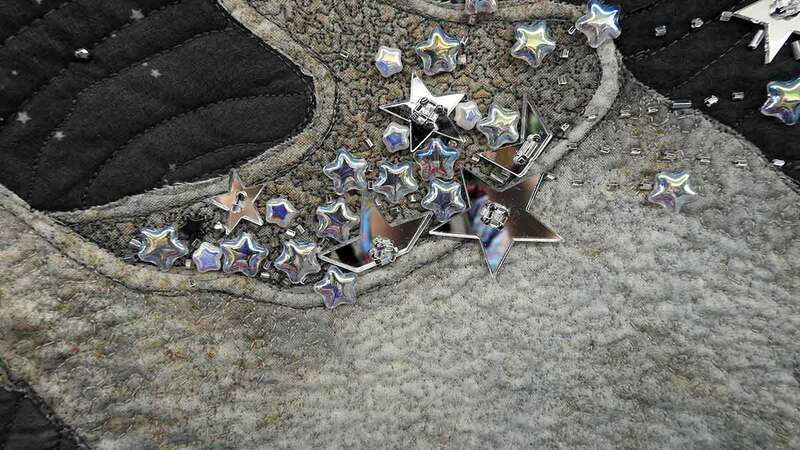 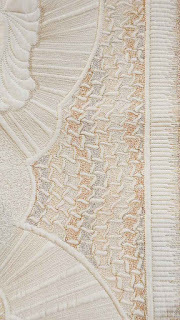 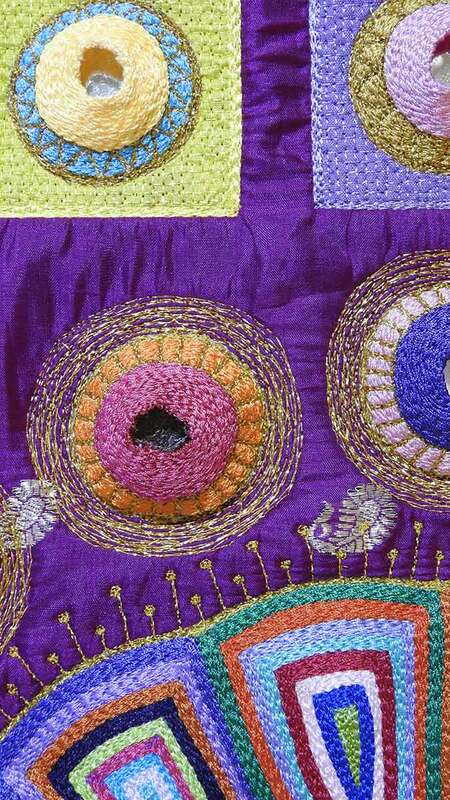 There is additional embellishment in the form of painting, embroidery and beading." Detail of "50 Hearts for 50 Years"
Eti David,, "Squares in Red"
Barbara Lange, "Monochrom 11 Ladybug"
Kathleen Loomis, "Fault Lines 6"
Barbara Lange, "Monochrom 22 - Dragonflies"
Detail of "Monochrom 22 - Dragonflies"
Back to the World quilts. 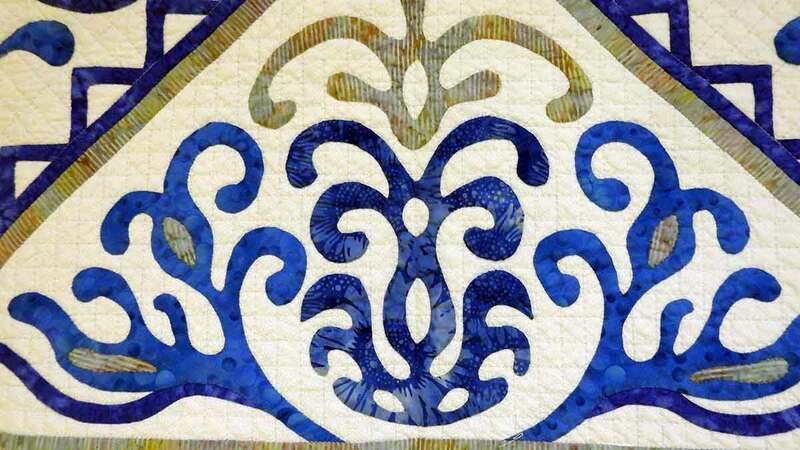 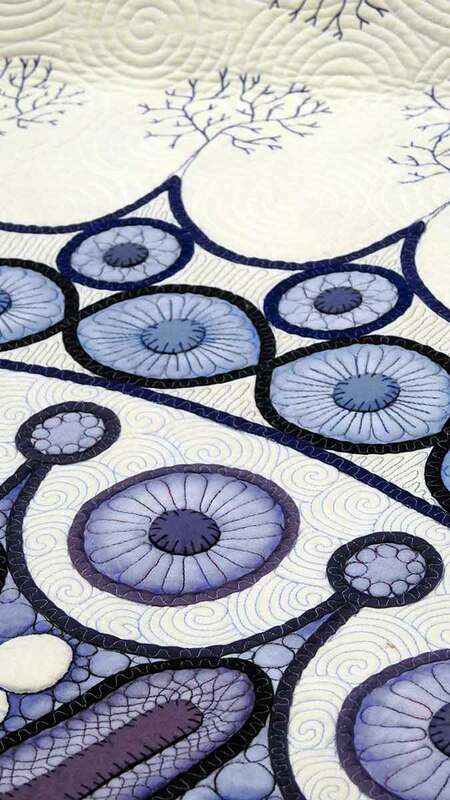 Marline Turner, South Africa, "Royal Doulton Delft or Wedgewood"
Detail of "Royal Doulton Delft or Wedgewood"
I love the use of solids and colors in the quilt below. Susan Wessels, South Africa, "Flow"
"When assummetry is coupled with a symmetrical structure, energy is created. 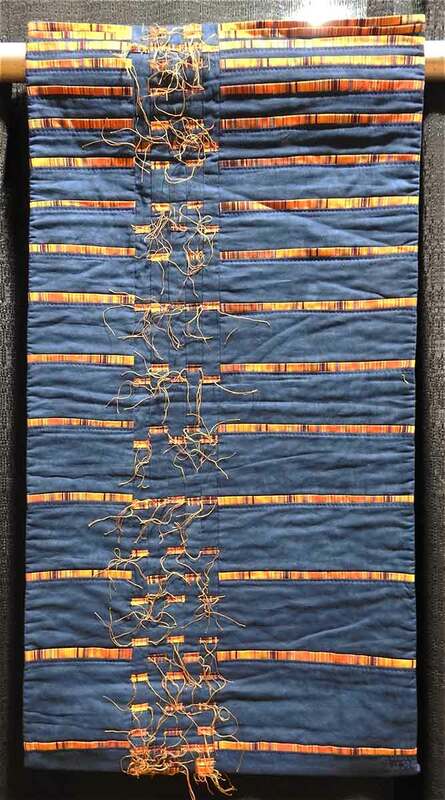 I have been exploring this in my work for a while and tried to push the complexity of the asymmetrical aspects in this particular piece." 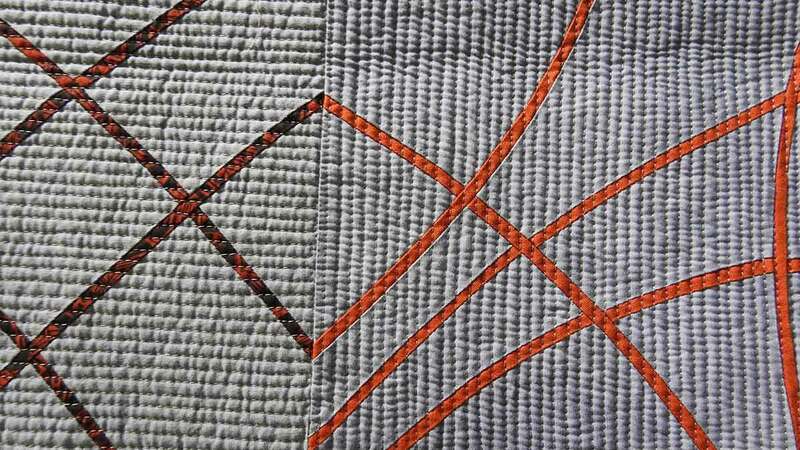 These three quilts below are very interesting. 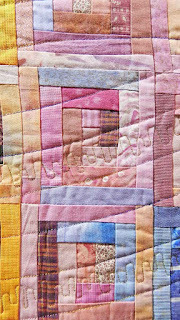 They are quilts with heavy paint. 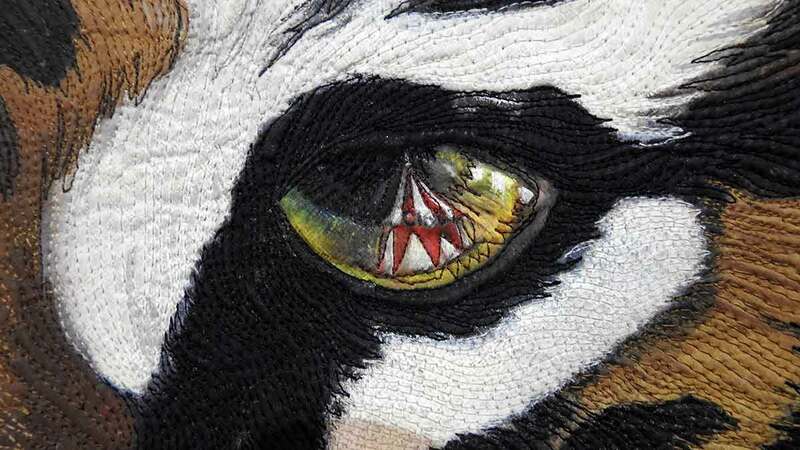 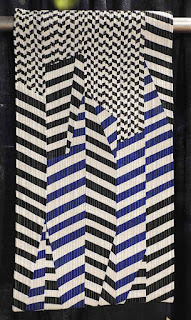 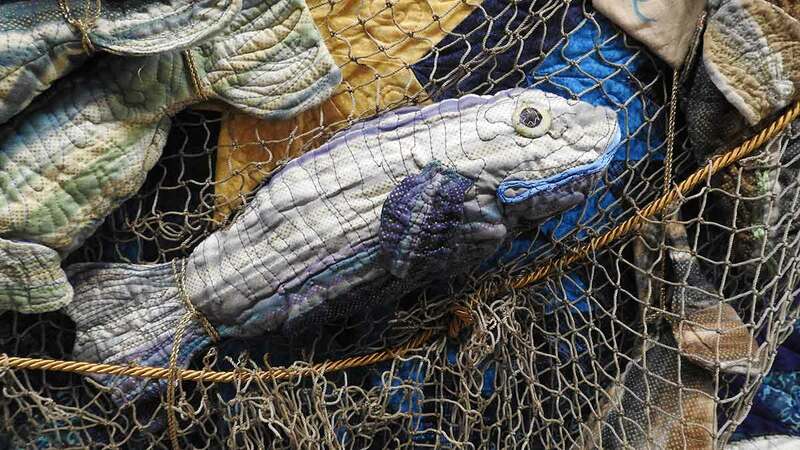 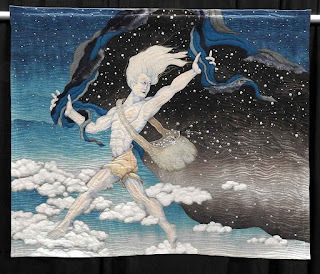 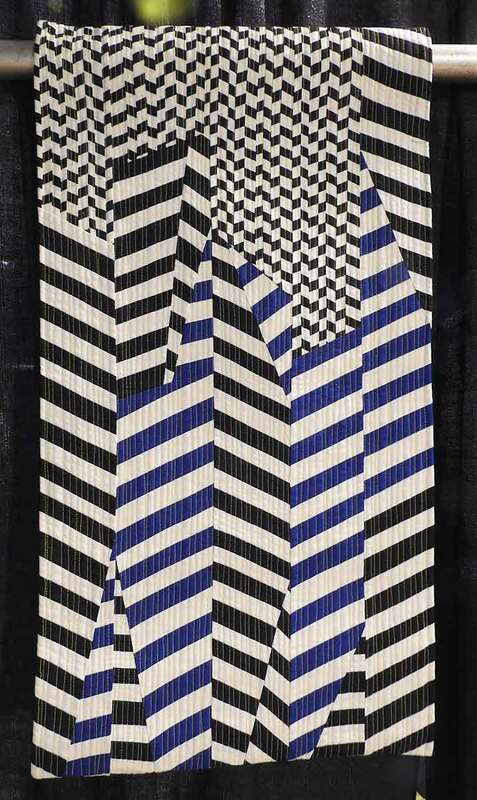 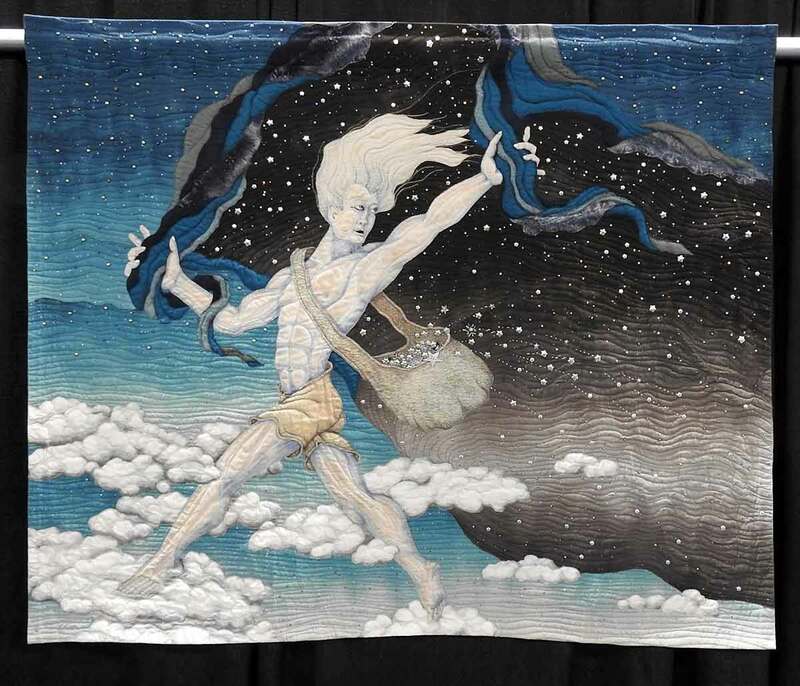 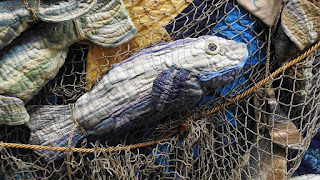 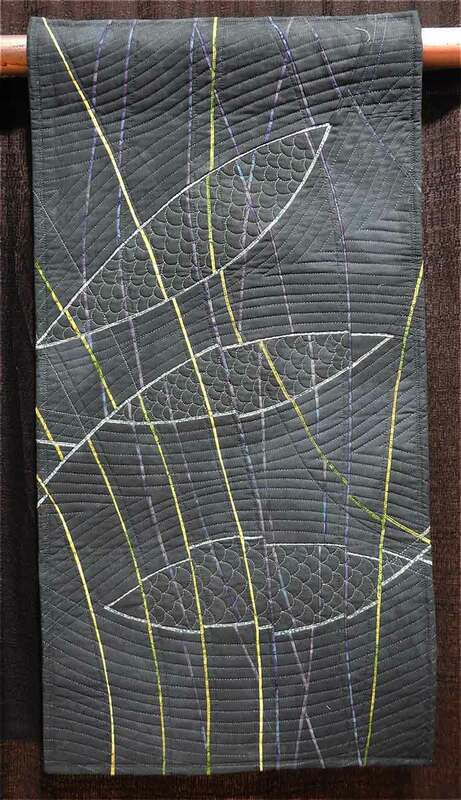 Roy Starke, South Africa, "Midnight"
"Hand and machine applique; hand and machine embroidered; reverse applique, fabric weaving, bonded, made braid for edging, cemented impasto, hand painted, machine quilted. 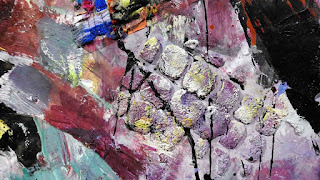 The reproductive function of painting has lost its importance. 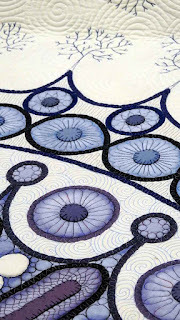 We now use our intellectual ability as reference. 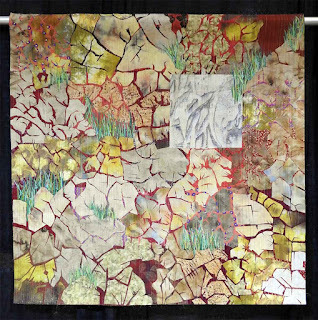 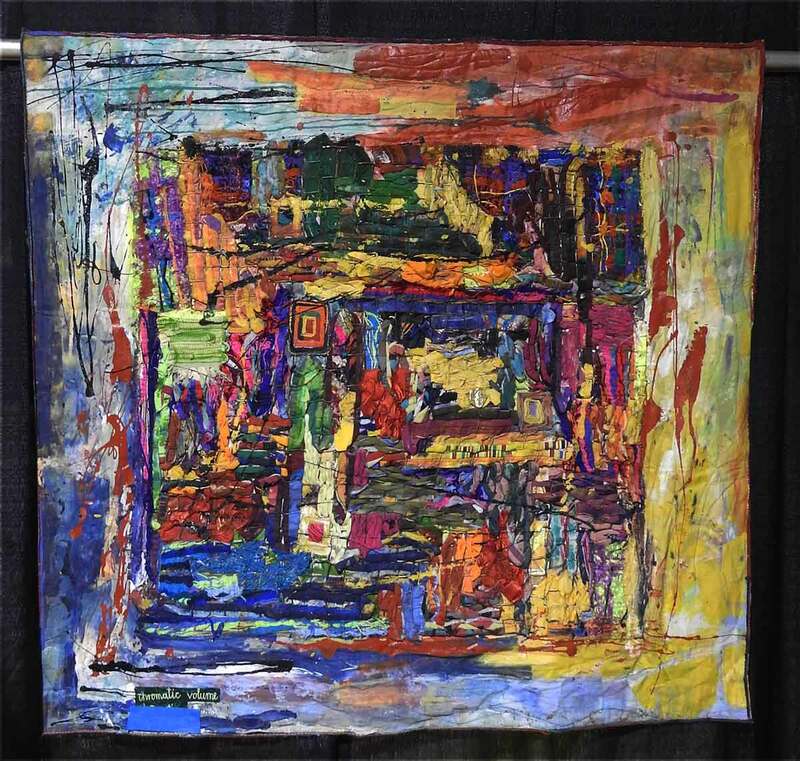 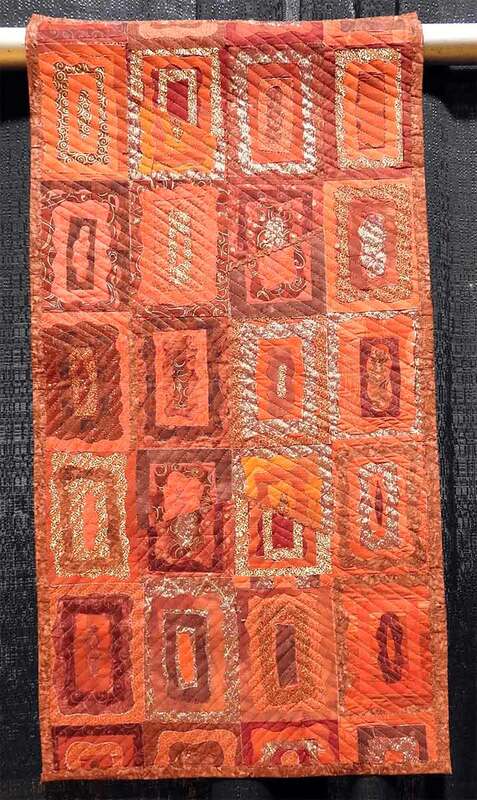 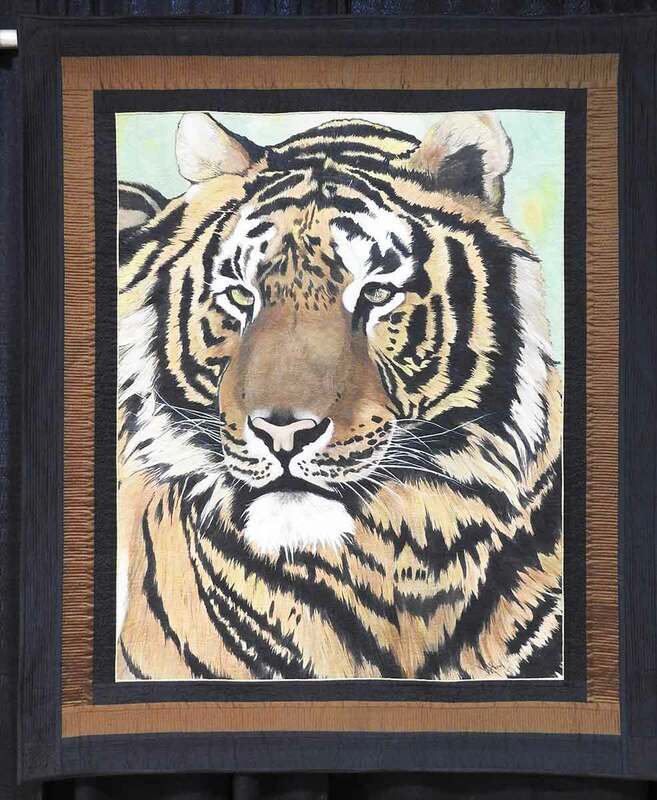 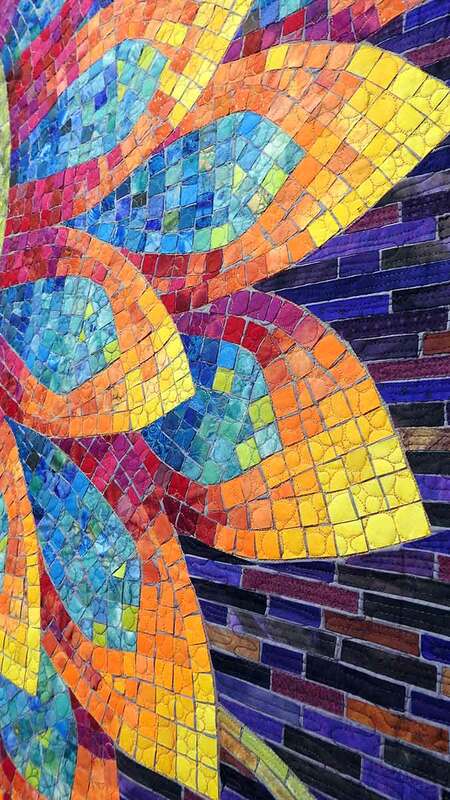 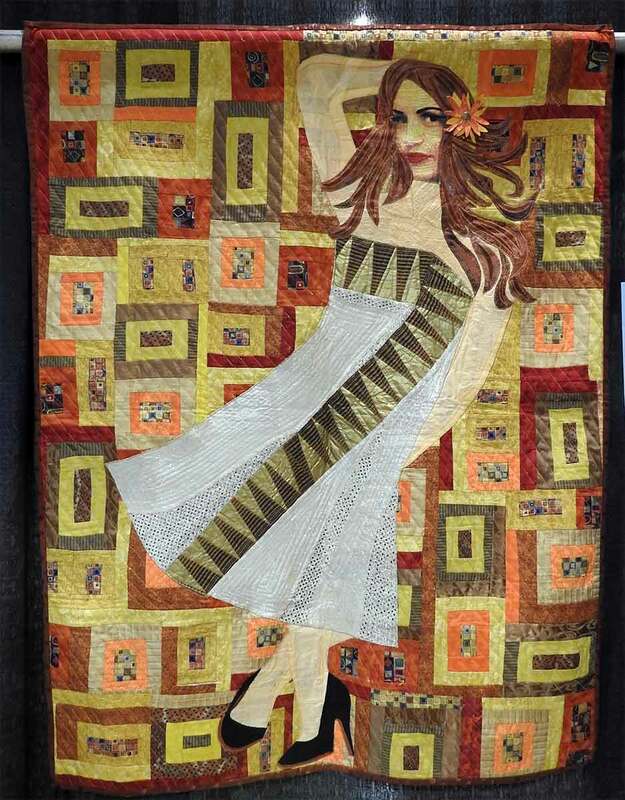 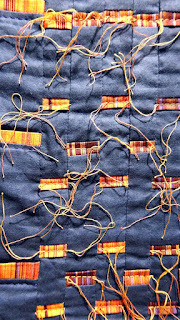 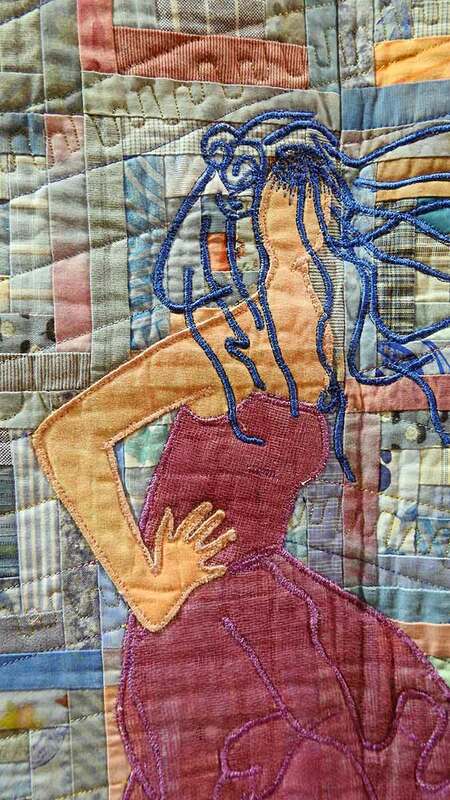 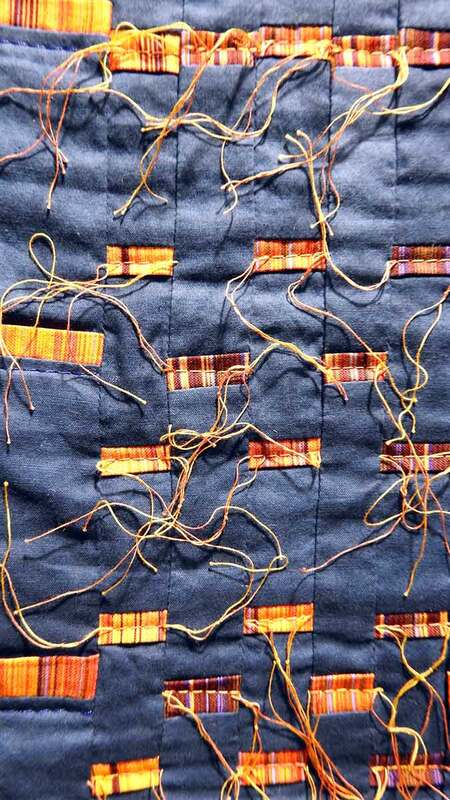 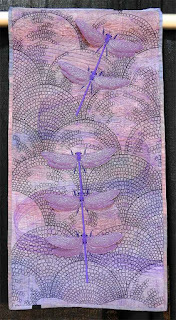 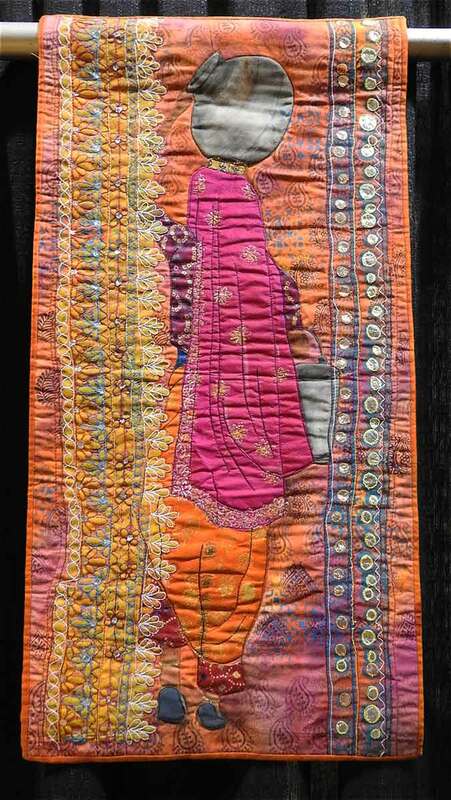 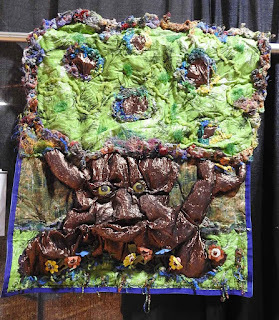 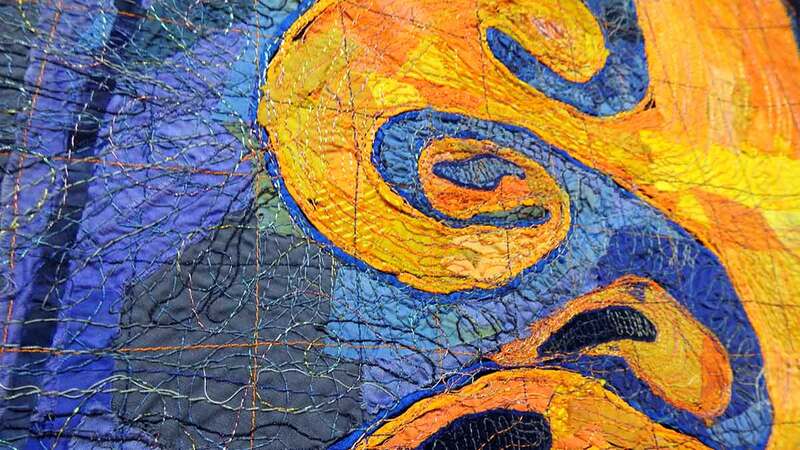 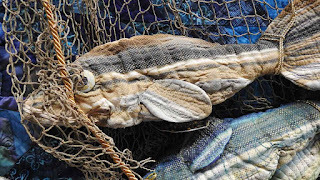 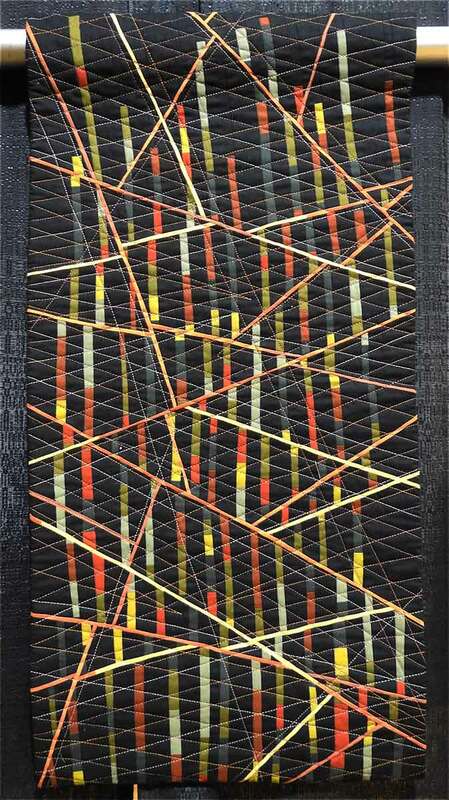 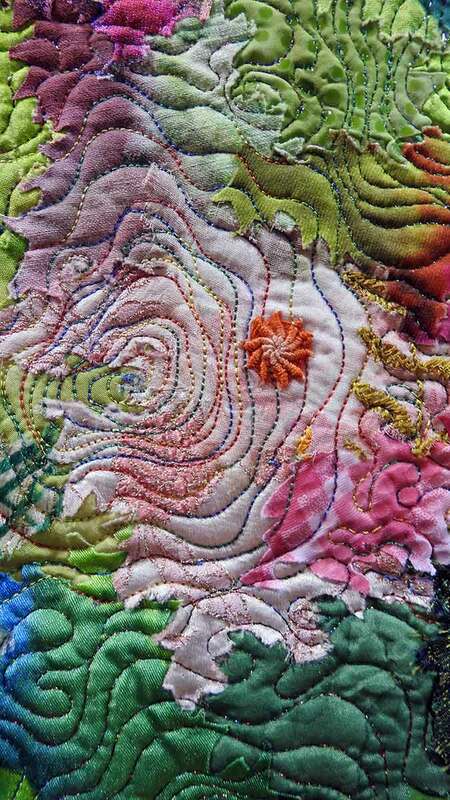 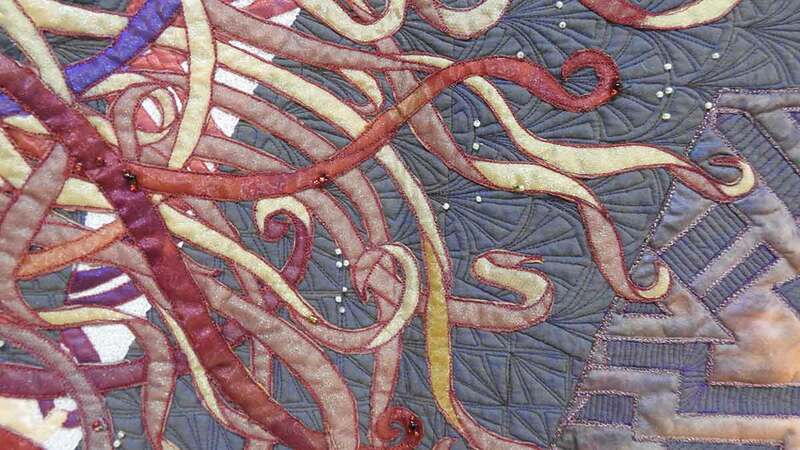 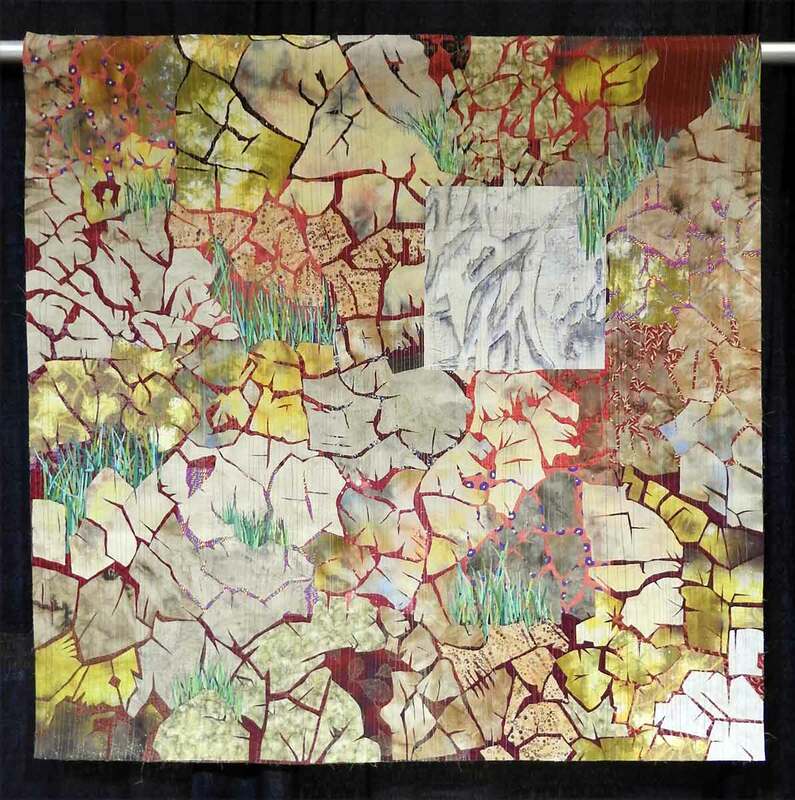 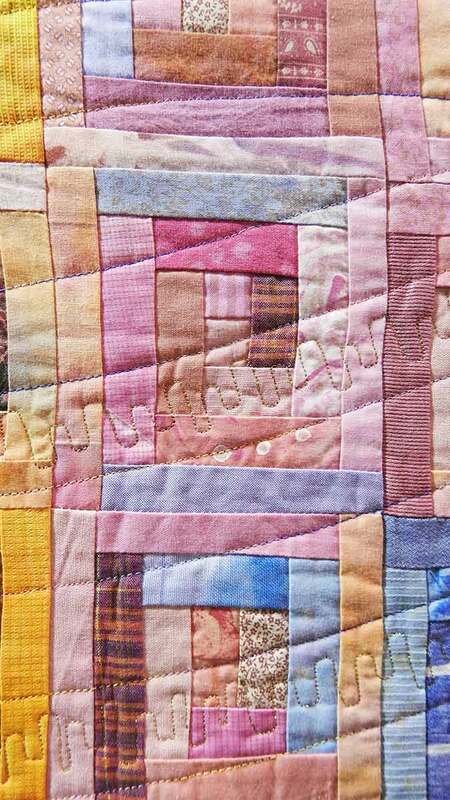 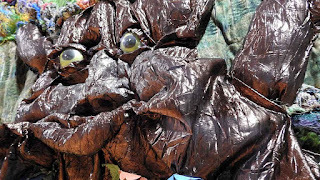 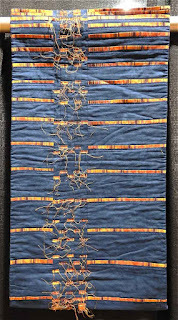 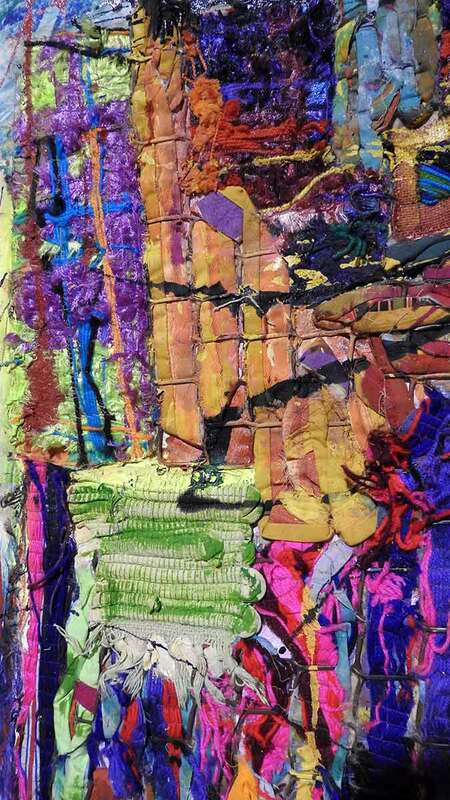 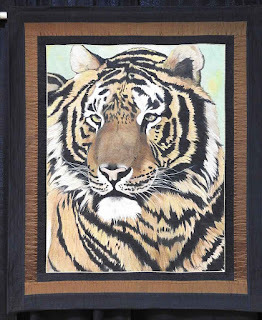 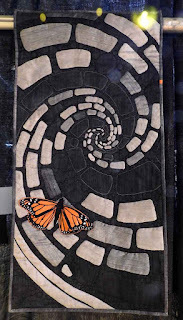 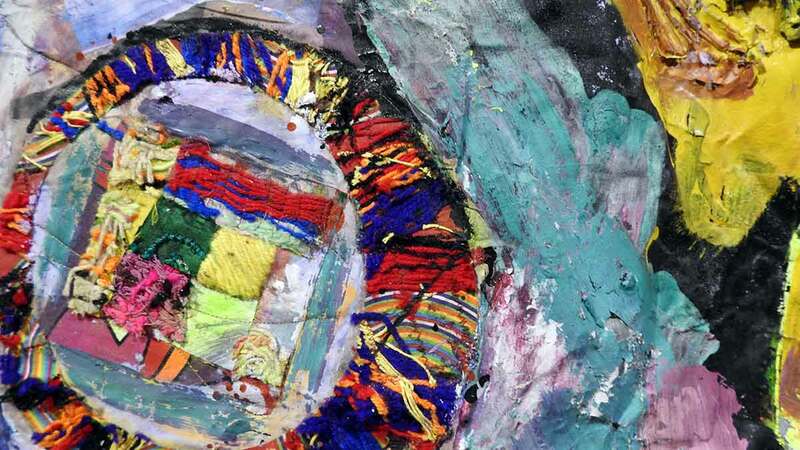 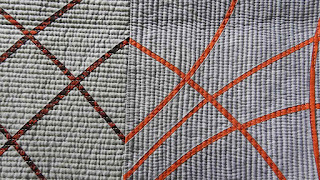 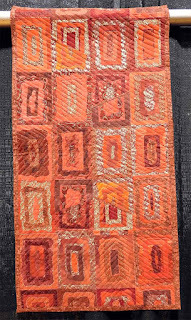 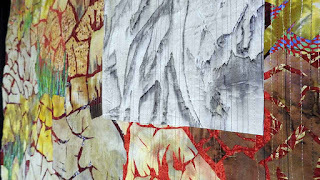 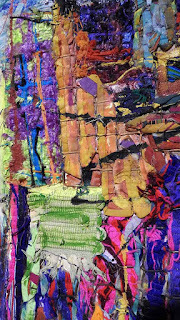 The dominant concepts in the art quilt is the transformation of natural appearance. The corresponding reflection is what is produced by the 'human heart.' 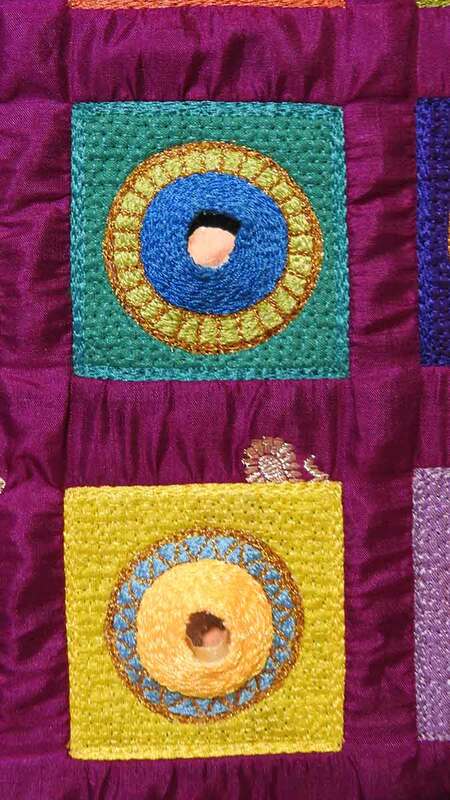 The quilt must have its own surface and depth." 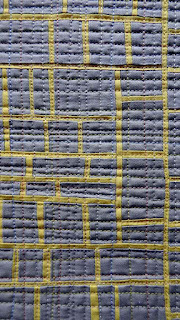 Roy Starke, South Africa, "Chromatic Volume Abstraction"
Detail of "Chromatic Volume Abstraction"
Village Quilters Guild, South Africa, "That Blooming Mosaic"
"This is an original design interpreted in mosaic style and applique created from a selection of hand dyed and commercially printed 100% cotton fabrics. 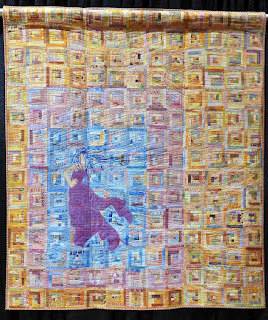 More than 40 women worked on this quilt." Detail of "That Blooming Mosaic"
I love the quilt below. 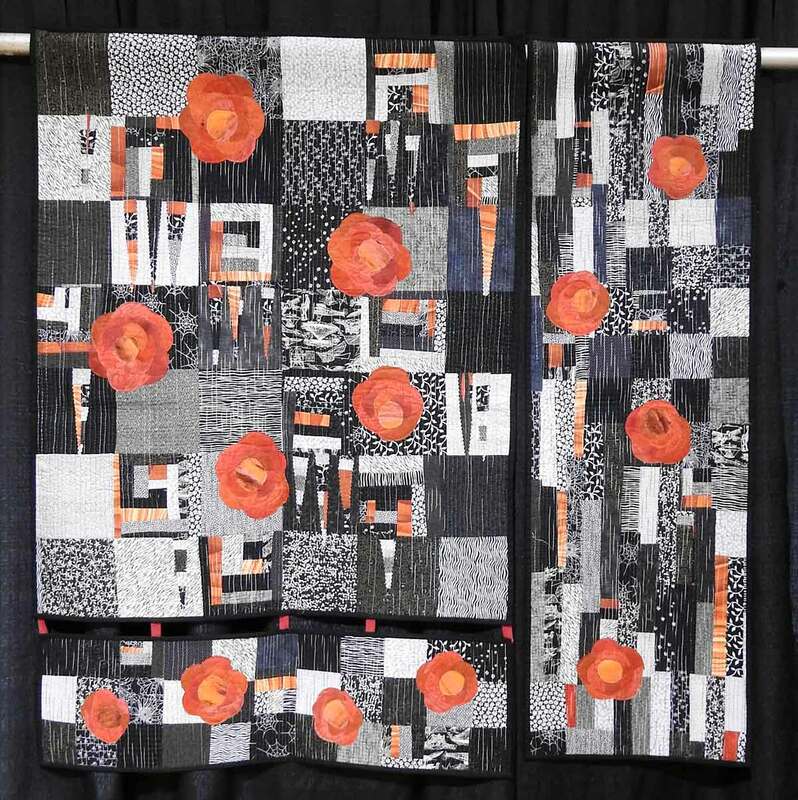 The grays, oranges and blues make it a really stunning quilt. Laetita C Cilliers, South Africa, "Fences 2 - Brazenly Violated"
"The second in a series reflecting on barbed wire fences in South Africa. 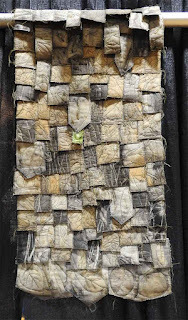 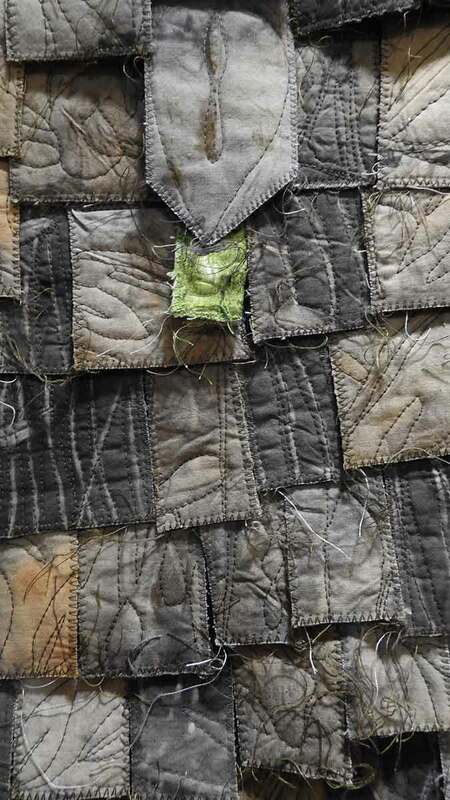 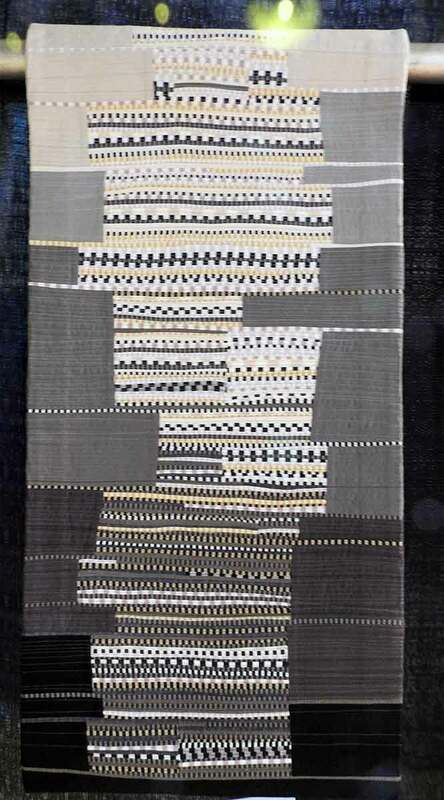 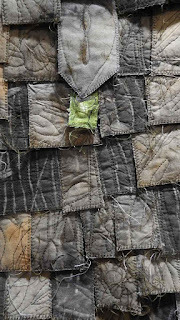 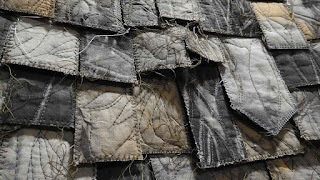 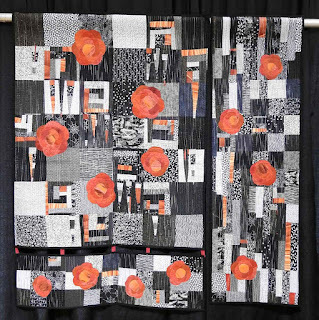 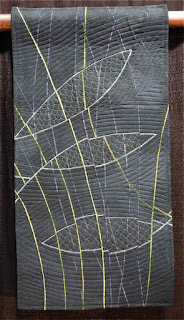 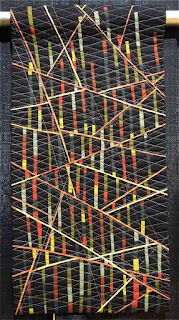 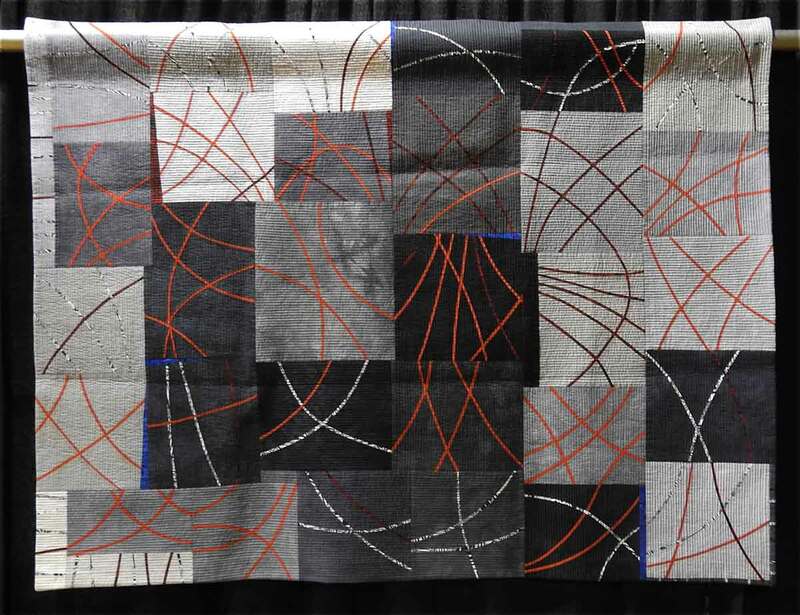 A somber quilt with fences represented by curved lines set into hand dyed greys. 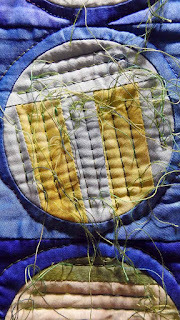 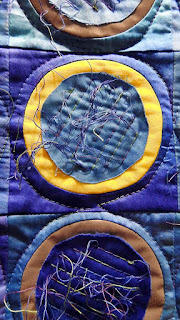 Snippets of blue, machine pieced and walking foot quilted. 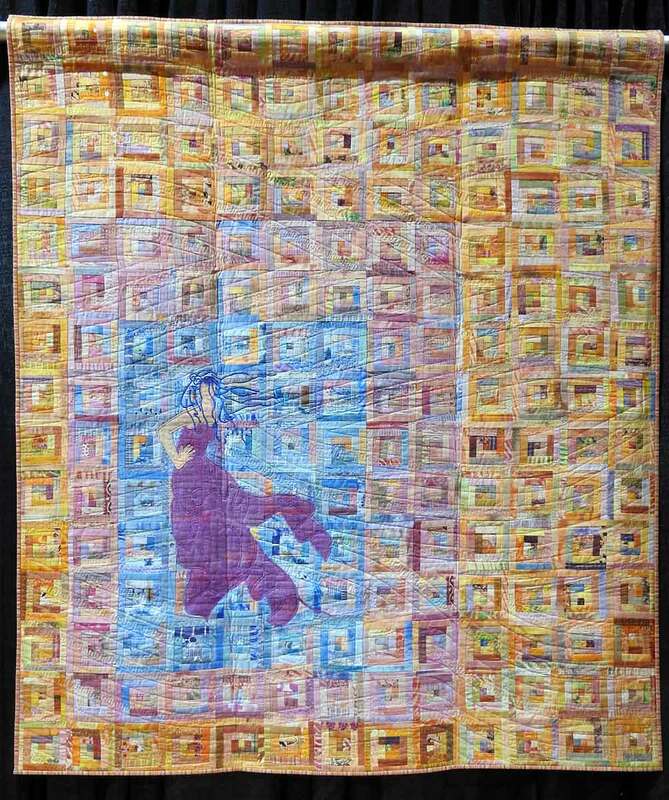 The quilt was made in reaction to a disturbing event. 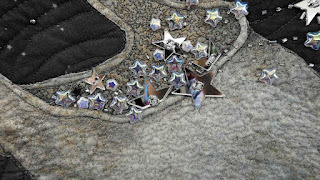 My husband was stabbed when he caught a burglar by surprise in our kitchen in October 2016. We used bleu towels to cover the blood." Detail of "Fences 2 - Brazenly Violated"
Katherine Jones, Australia, "Methylene Blue Mandalas"
"Inspired by cells on a microscope slide stained with Methylene Blue. 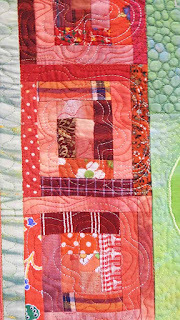 Bias binding and needleturn applique, colored pencils and FMQ with threads from 60 wt to 16 wt were used to create this quilt. 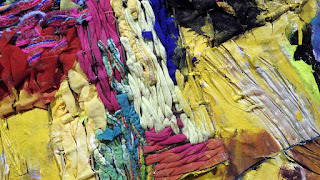 Can be hung in any orientation. 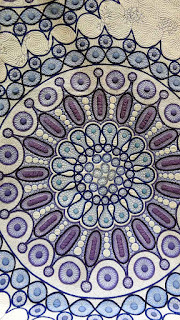 Detail of "Methylene Blue Mandalas"
Cathy Jack Coupland, Australia, "To India with Love"
"Experimentation has led to my development of a machine made technique for traditional Indian Shisha embroidery. 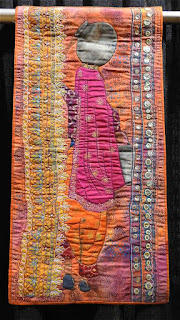 Both in-laws were born and grew up in India linking us with this amazing country. 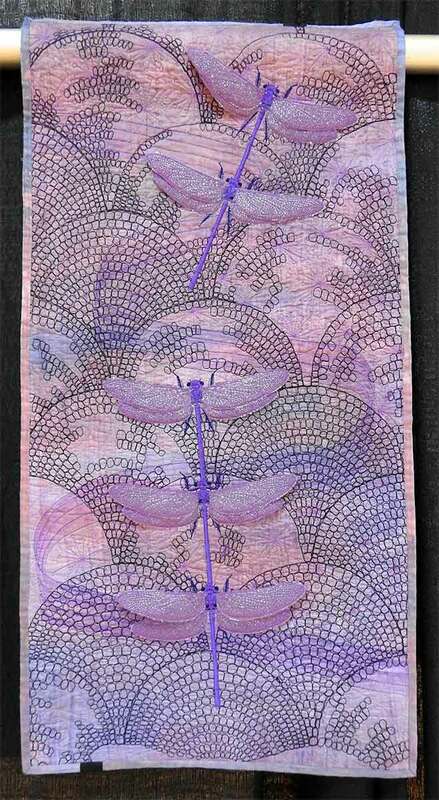 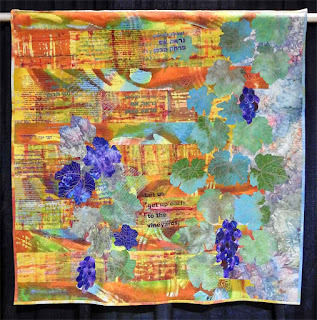 A silk scarf was used as the inspiration and background for this work. Various coloured silks lay behind each mirror and three machine embroidered applique pieces were added for extra punch." 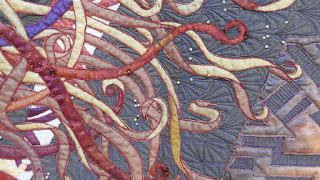 Detail of "To India with Love"
Sue de Vanny, Australia, "Erte's Bazaar"
Cindy Andes, Titusville, PA, "Whimsical Regrowth"
Susan Fiorentino, Rome, Italy, "Finding Strength in her Net"
Detail of "Finding Strength in her Net"
Thom Atkins, Santa Cruz, CA, "The Edge of Night"
Detail of "The Edge of Night"
Here is my quilt (actually hubby's), "I Love Love Love". 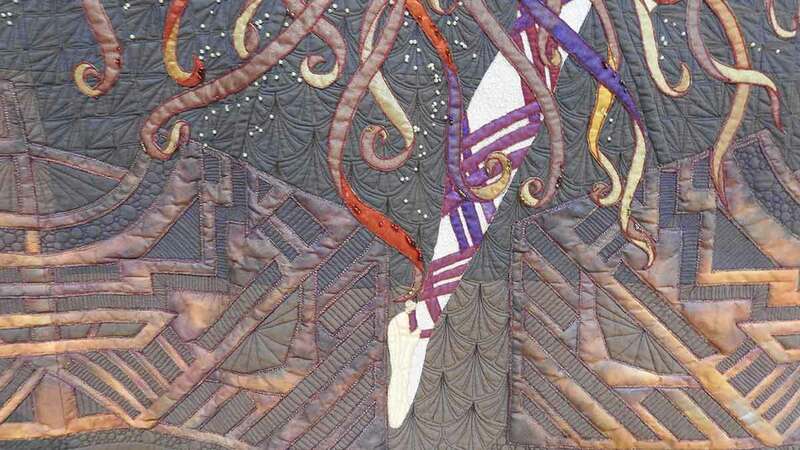 This is exhibition is probably her "swan song" since this quilt was finished in 2015, and most quilt shows only allow a certain time frame. This was a funny sight and sign. 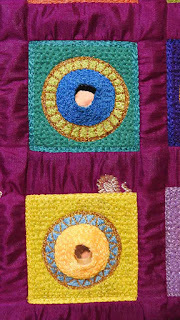 Thank you for featuring my quilt "Brazenly Violated". 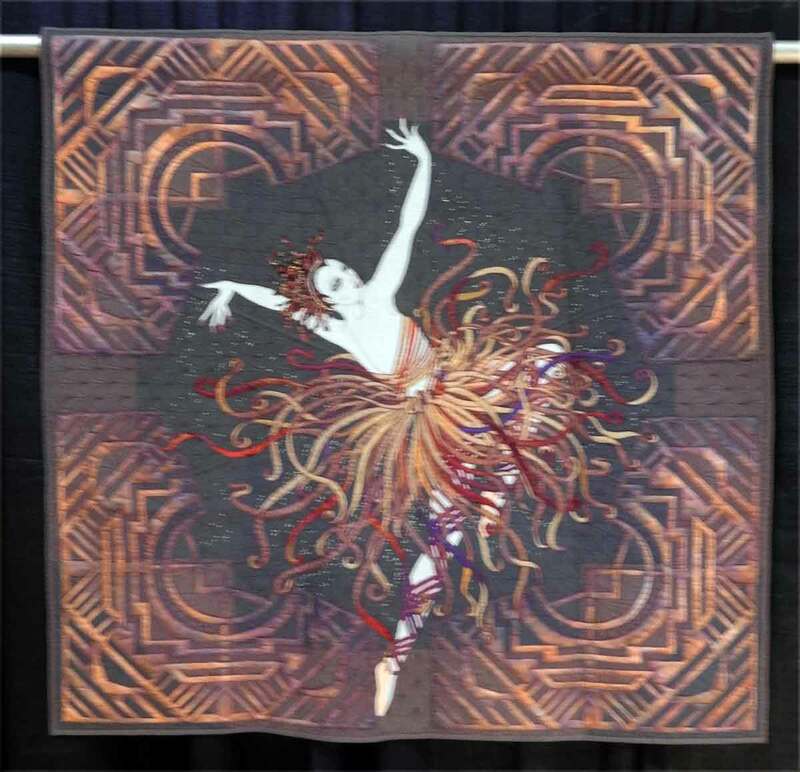 I was on a 3week visit to the USA, but chose to attend Fall festival in Paducah, rather than go see our South African quilts hanging in the show. 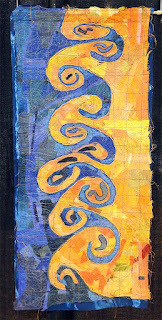 Learning to Foundation Paper Piece!